© 2002, © 2018 by Paul Freeman. Revised 6/11/18. “Border” Airport, as depicted on the 1934 Airway Chart. nor on the 1930 USGS topo map. 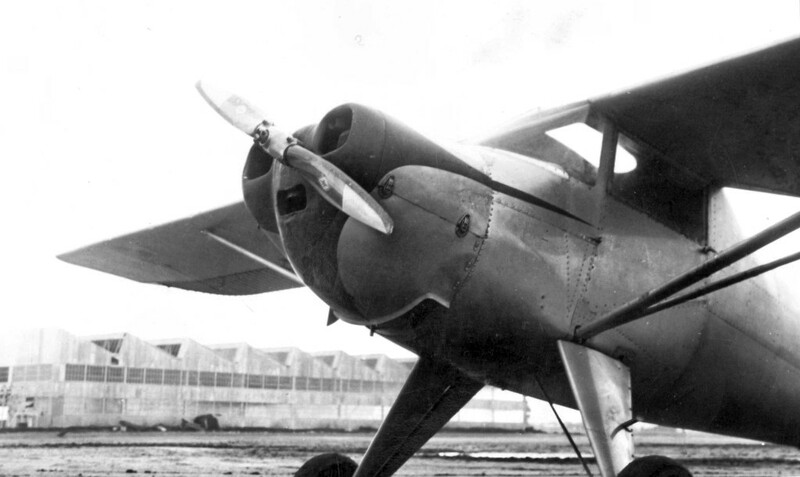 According to Curtis Carroll, “The earliest known date for the Border Air Service Field is 1931. It was located on US 101. 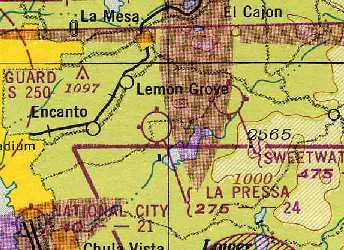 Ted Jacquot, brother of Robert (Grande Vista Airport), and Richard Hutton operated the 2,300' x 1,200’ irregularly-shaped field. which depicted Border as a commercial/municipal airport. 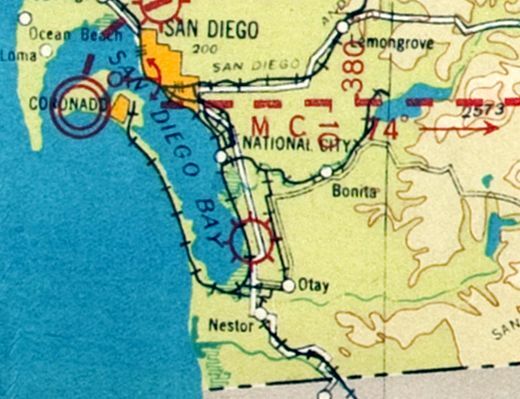 nor on the 1943 or 1945 San Diego Sectional Charts. After the war, the field name changed to Borderland Airport & reopened with new owners Bob & Alice Foster & Ted Diver (according to the 11/2/45 Chula Vista Star, courtesy of Curtis Carroll). An airport courtesy car took visiting pilots to the border or they could catch a bus every 15 minutes. An undated photo courtesy of Curtis Carroll) of “Some of the 14 airplanes that landed at Borderland Airport 4/27/47 from Fullerton. A 6/15/47 advertisement for Borderland Airport (courtesy of Curtis Carroll). An 8/15/47 advertisement for Borderland Airport (courtesy of Curtis Carroll). 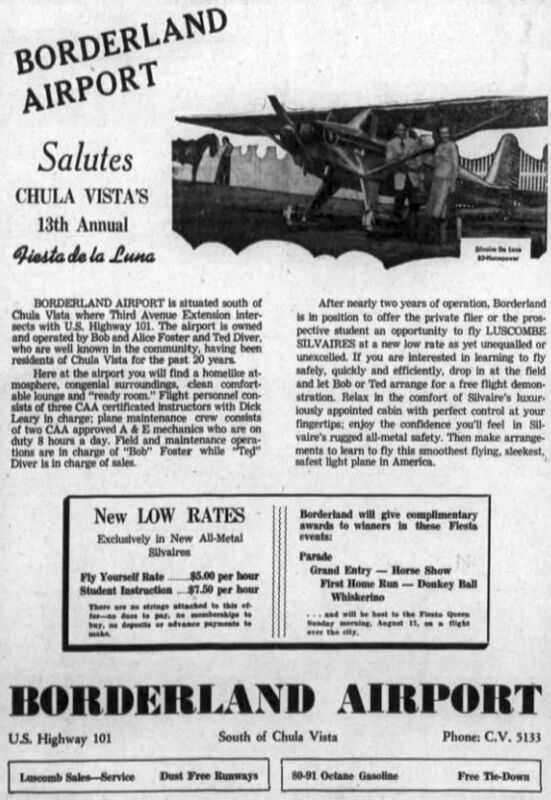 An August 1947 Flying Magazine listing (courtesy of Curtis Carroll) warned pilots not to stray into Mexican air space or face a $60 “customs fee”. The listing mentioned a 1,900' northwest/southeast oiled runway & major overhaul facilities. was on the March 1948 San Diego Sectional Chart (courtesy of Ron Plante). It depicted Borderland as having a 1,900' unpaved runway. 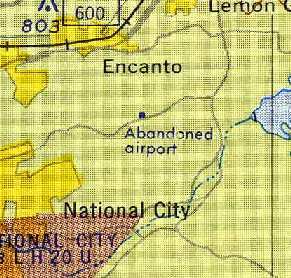 Borderland Airport was no longer depicted on the 1950 USGS topo map. According to Curtis Carroll, there was no mention of Borderland Airport in local newspapers after November 1950.
but it was presumably closed by that point. 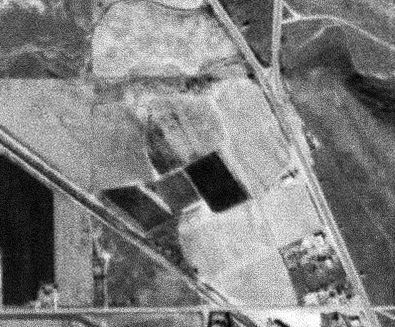 A 1/22/55 USGS aerial photo of the site of Borderland Airport appeared to show the property as having reverted to cultivation. 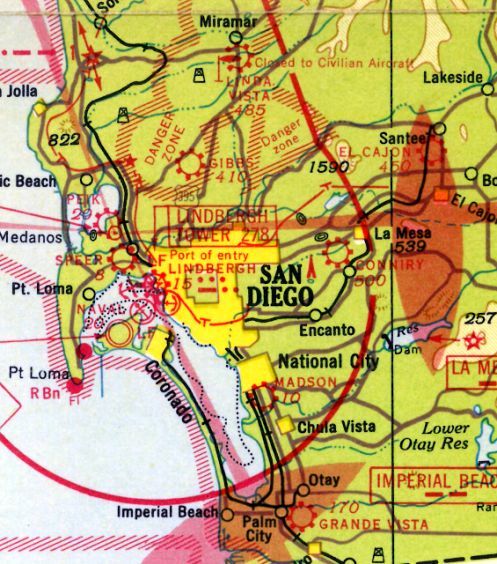 Borderland Airport was no longer depicted on the 1955 San Diego Sectional Chart. A 2016 aerial view showed no trace remaining of Borderland Airport. 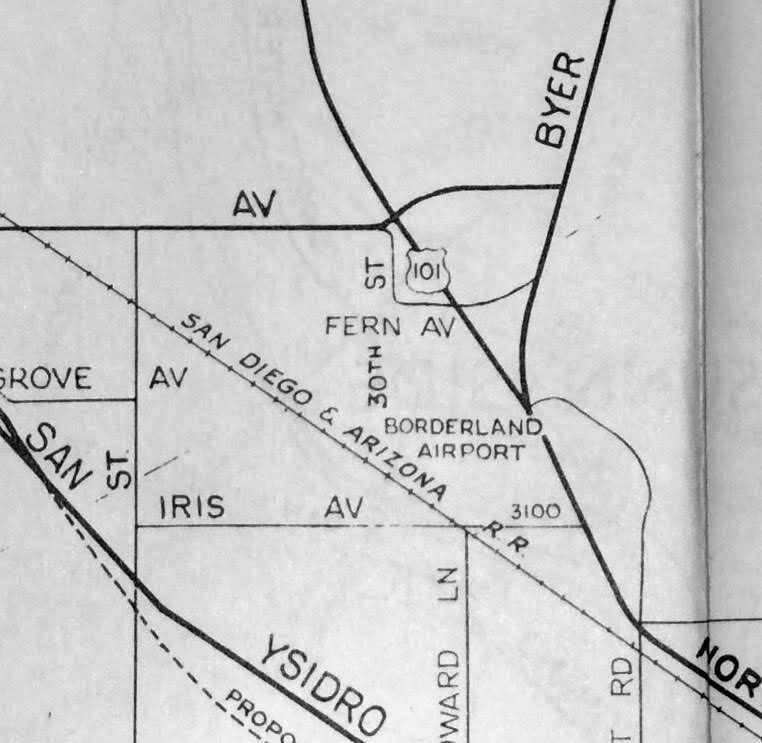 The site of Borderland Airport is located northwest of the intersection of Beyer Boulevard & Iris Avenue. and to Steve Schoenherr of the South Bay Historical Society for providing background information. Grande Vista Airport, as depicted on the 1934 Airway Chart. This early airport was was not yet depicted on the 1928 San Diego - Tucson Air Navigation Map. was established in February 1930 by Robert Jacquot on land leased from & near the home of Hugh Rose. 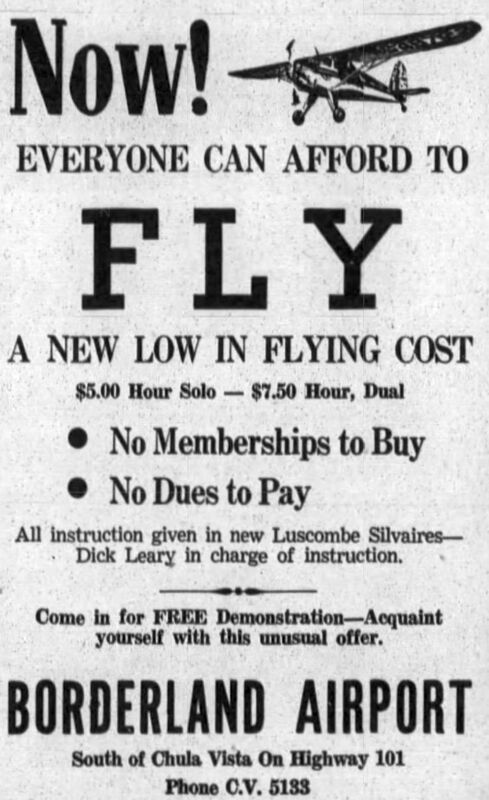 By the end of that month he had opened a gliding club at his new airport. In early 1932, he bought a Fairchild 22 monoplane to train students & demonstrate it for sales under the business name 'Grande Vista School of Aviation'. 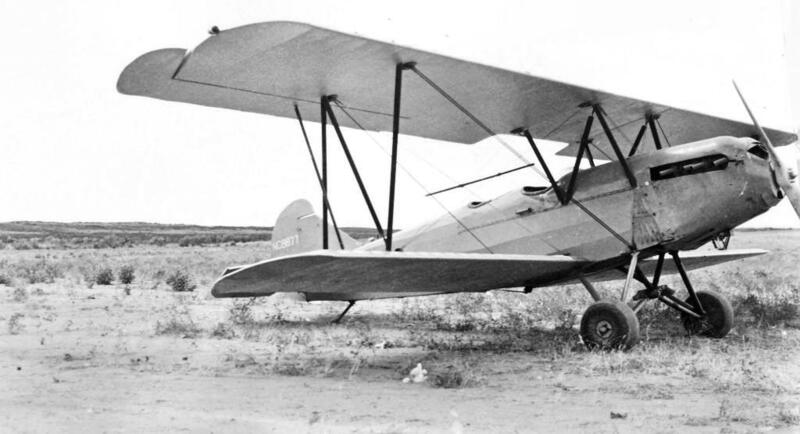 He also used the Fairchild to ferry single passengers to & from various locations in Baja California in the open cockpit plane. In the mid-1930s he would carry multiple passengers in enclosed cabin aircraft; first a Ryan B-1 & later at least two different Wacos. which depicted Grande Vista as a commercial/municipal airport. Grande Vista Airport, as depicted on the 1935 San Diego – Tucson Airway Chart. According to Curtis Carroll, “The airport had ceased operations by early 1938 when the San Diego Flying Club took over the lease. At that time, the airport had 3 short runways & 3 hangars to handle the club’s 2 Taylor Cubs & a Porterfield cabin monoplane. The hangars had the field name on the roof & the club name on the outside walls. 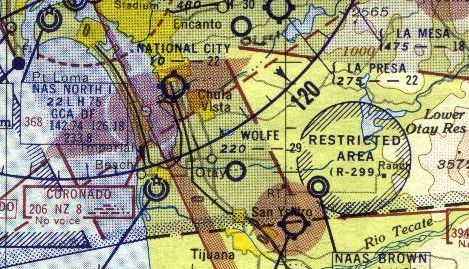 The last aeronautical chart depiction which has been located of Grande Vista Airport was on the 1943 August San Diego Sectional Chart (courtesy of Ron Plante). 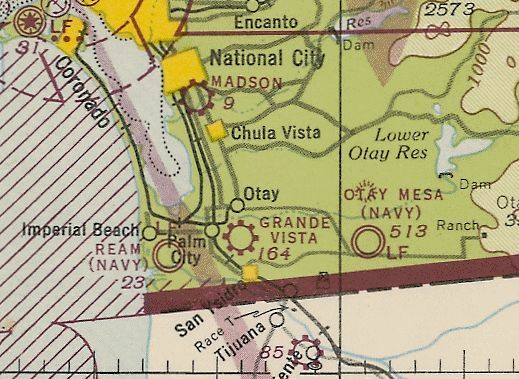 The only topo map depiction which has been located of Grande Vista Airport was on the 1943 USGS topo map. It depicted a property outline oriented northwest/southeast, labeled simply as “Landing Field”. There were no buildings depicted at the airport. According to Curtis Carroll, “Shortly after WWII ended, Robert Jacquot intended to reopen his former airport when a tragedy occurred. 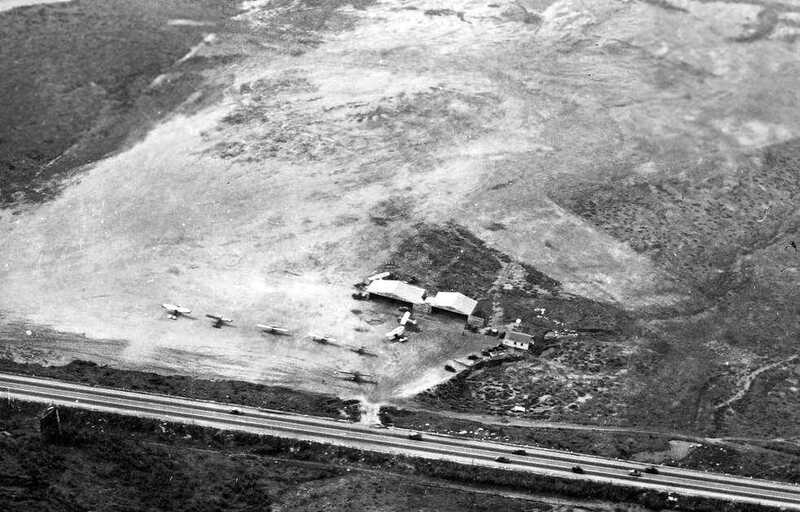 A 1953 aerial photo of the Grande Vista Airport site showed a rough northwest/southeast unpaved runway, with a small building on the southeast side. There were no aircraft visible on the field. although the building at the southeast end remained intact in a 1968 aerial photo. A 2016 aerial view showed no trace remaining of Grande Vista Airport. The site of Grande Vista Airport is located southeast of the intersection of Palm Avenue & Beyer Boulevard. Thanks to Curtis Carroll for pointing out this airfield. 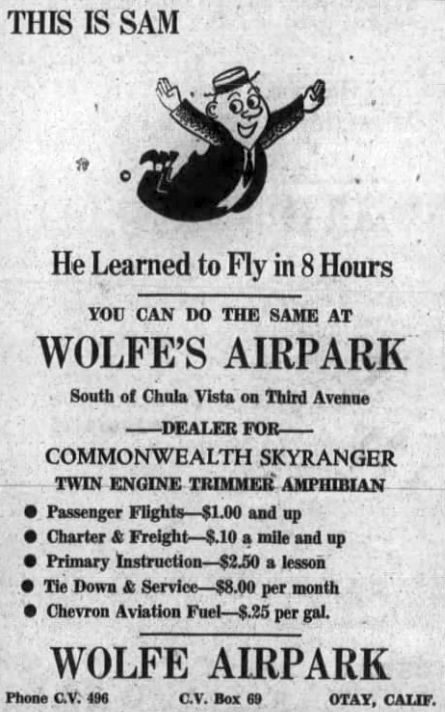 A circa 1946-47 advertisement for Wolfe Airpark from the Chula Vista Star (courtesy of Curtis Carroll). and it was advertised in the Chula Vista Star (courtesy of Curtis Carroll). 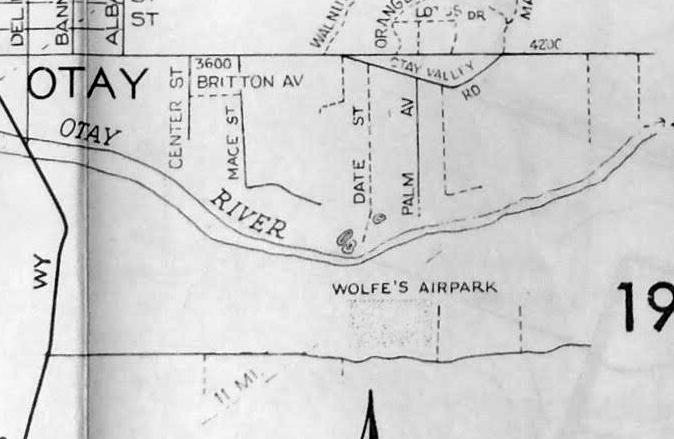 “Wolfe Airport” as depicted on a 1947 street map (courtesy of Curtis Carroll). with a crosswind runway oriented northeast/southwest “nearing completion”. It depicted Wolfes as having a 3,000' unpaved runway. The only photo which has been located showing Wolfe Airpark was an undated aerial view looking north from the 1950 Air Photo Guide (courtesy of Kevin Walsh). It depicted Wolfe Airpark as having an unpaved northwest/southeast runway. 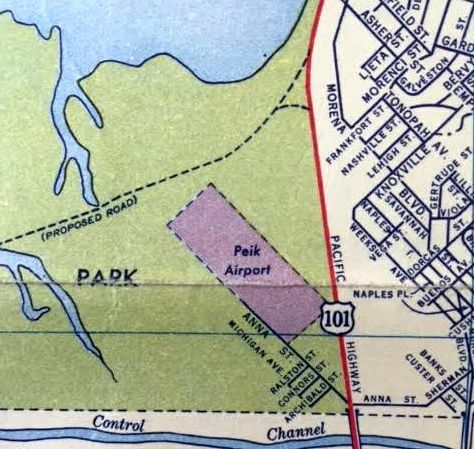 The 1950 USGS topo map labeled the airport as “Wolfe Park (Commercial)”. 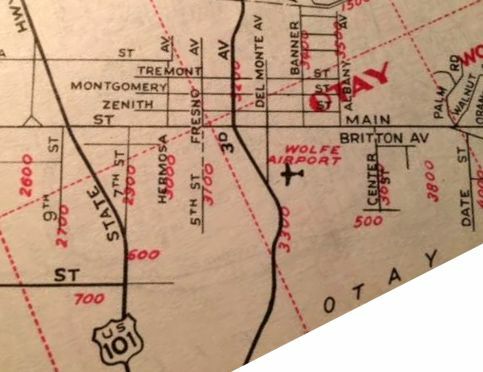 “Wolfe Airport” as depicted on a 1952 street map (courtesy of Curtis Carroll). The last topo map depiction which has been located of Wolfe Airpark was on the 1953 USGS topo map. It depicted a northwest/southeast runway, labeled simply as “Landing Field”. Three small buildings were depicted on the west & north sides. 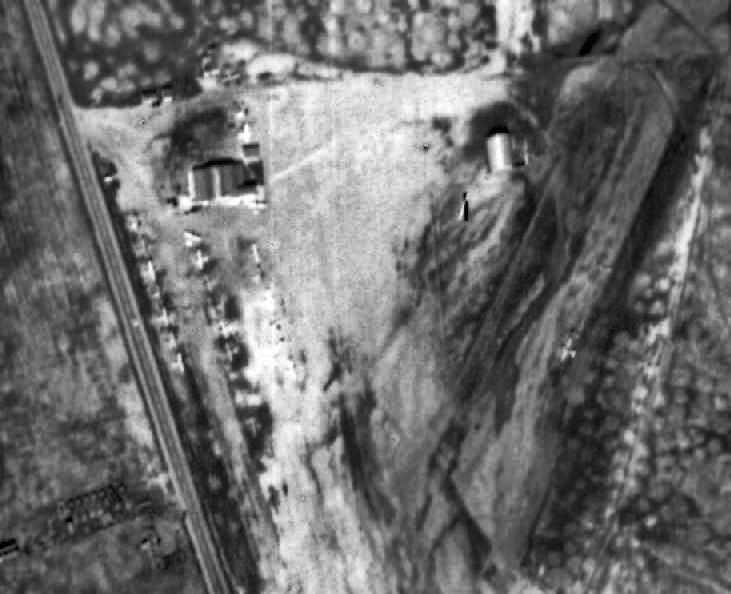 The only photo which has been located of Wolfe Airpark is a 1953 USGS aerial photo. and a total of 5 light single-engine aircraft parked on the north & south sides of the airport. 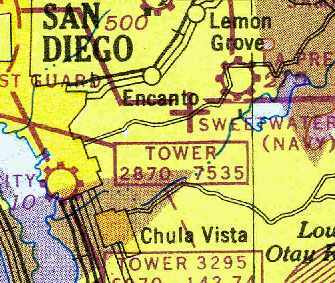 The last depiction which has been located of Wolfe Airpark was on the 1955 San Diego Sectional Chart. 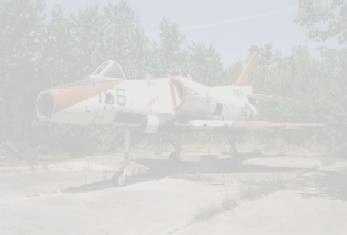 It depicted Wolfe as having a 2,900' unpaved runway. as it was no longer depicted on the August 1963 San Diego Sectional Chart (courtesy of Ron Plante). and Finney Elementary School covering the eastern portion, but the middle portion of the runway remained recognizable. 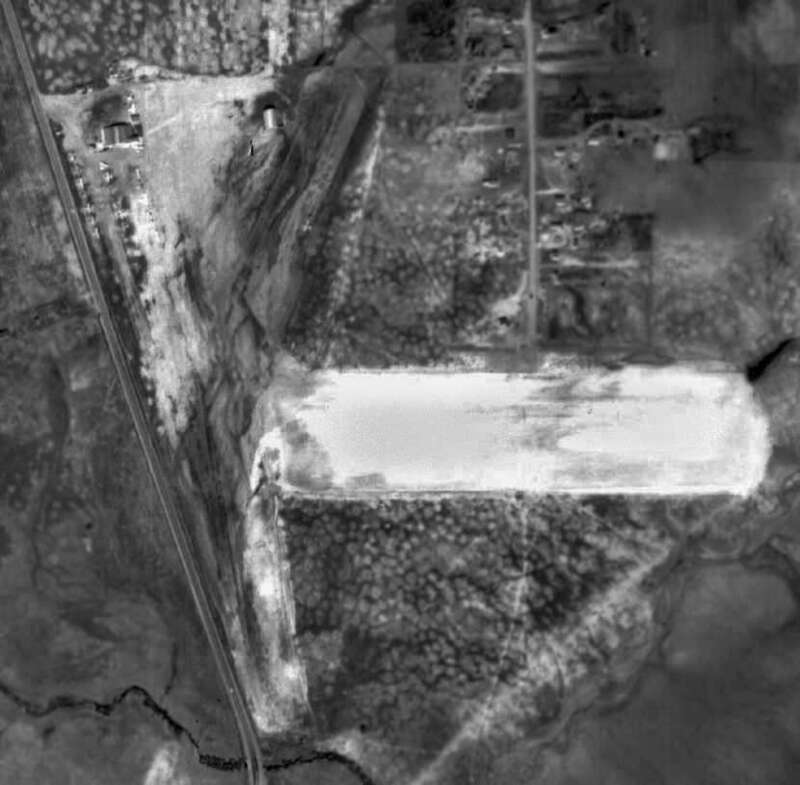 The middle portion of the Wolfe Airpark runway remained recognizable in a 1966 aerial photo. 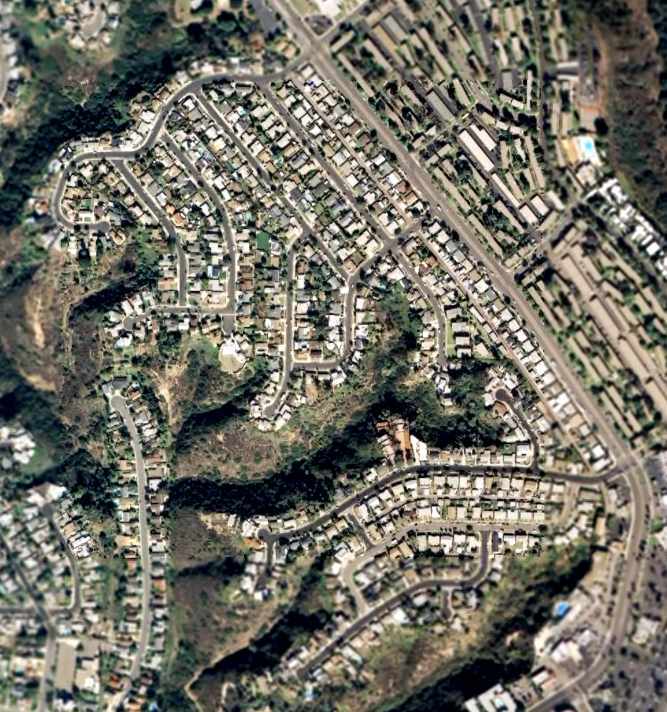 A 1971 aerial photo showed a dense housing development having erased the last trace of Wolfe Airpark. A 2016 aerial view showed no trace remaining of Wolfe Airpark. The site of Wolfe Airpark is located north of the intersection of Palm Avenue & Cochran Avenue. The property's aviation past is commemorated with the names of residential streets, such as Lindbergh Street, Doolittle Avenue, Le May Avenue, and others. 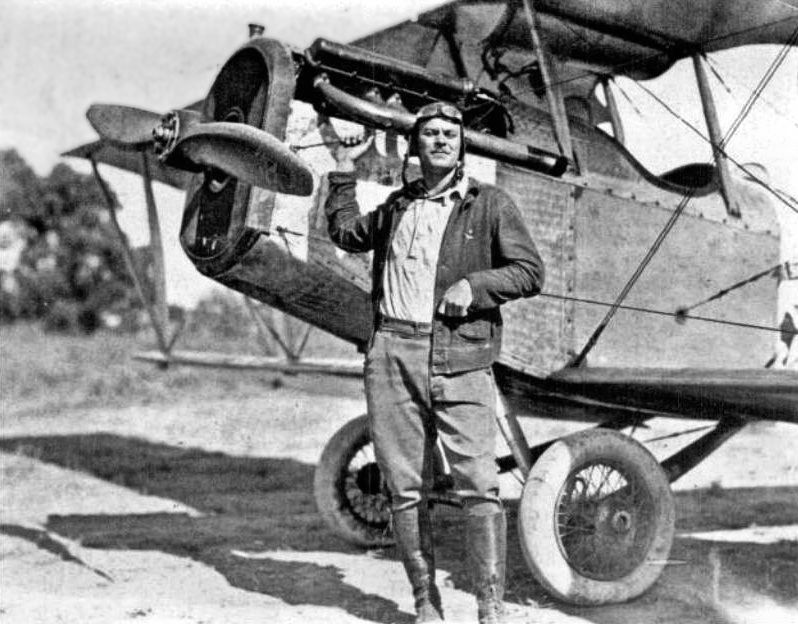 A 1926 photo of pilot Roland Tyce at the Tyce Flying School located at Chula Vista Airport. 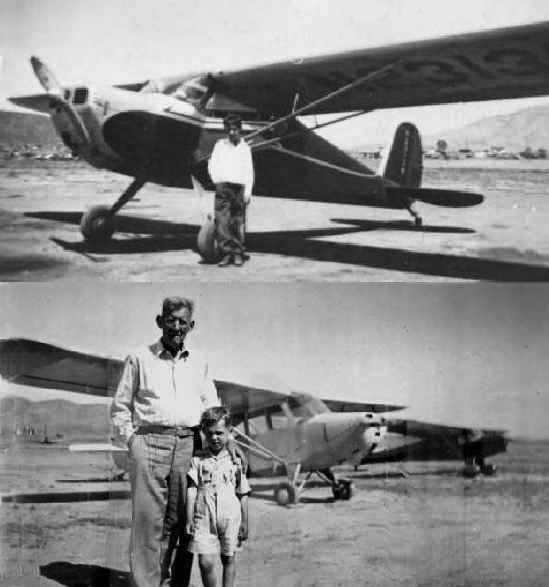 According to Richard Scheid, Chula Vista Airport was established in 1921.
was a 1926 photo of pilot Roland Tyce at the Tyce Flying School located at Chula Vista Airport. which depicted an unlabeled airport symbols roughly at the location of Chula Vista. An undated aerial view looking east at Chula Vista Municipal Airport” from the Richfield Oil Company's 1930 California Airports directory (courtesy of Kathy Vaughn). The directory described Chula Vista as having a 1,900' northwest/southeast runway & a 1,200' northeast/southwest runway, and listed the Manager as R. Tyce. with several hangars & buildings along the north end. 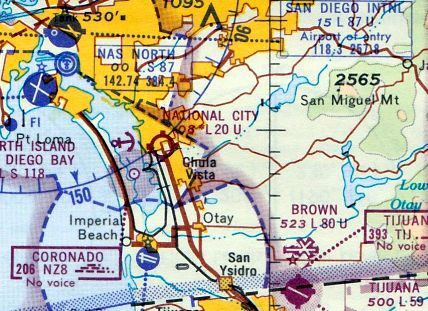 The only aeronautical chart depiction which has been located labeling Chula Vista Airport was on the 1934 Airway Chart. 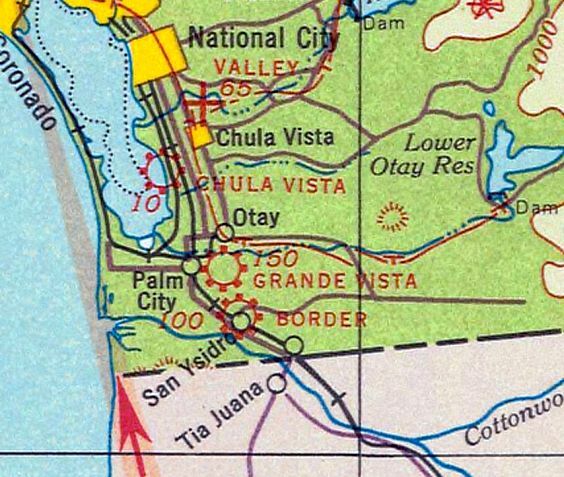 It depicted Chula Vista as a commercial/municipal airport. An undated (circa 1930s?) 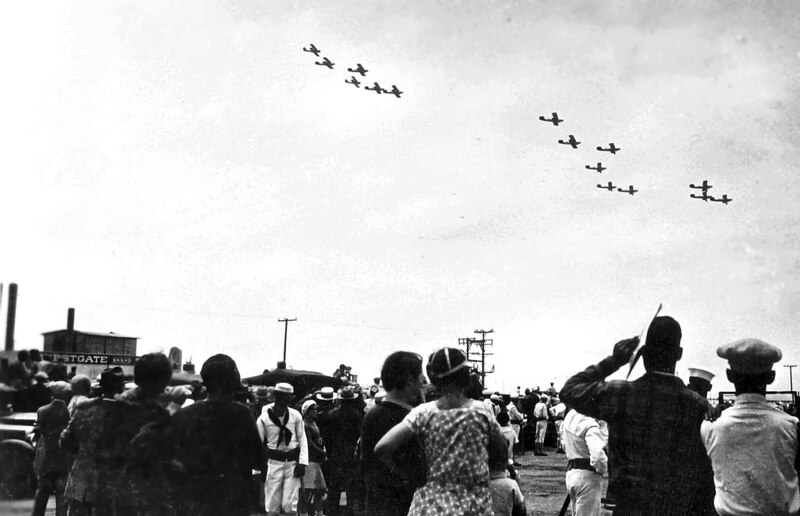 photo of a crowd watching biplane formations overflying Tyce's Airport presumably during some kind of airshow. An undated (circa 1930s?) photo of several unidentified biplanes at Tyce's Airport. An undated (circa 1930s?) 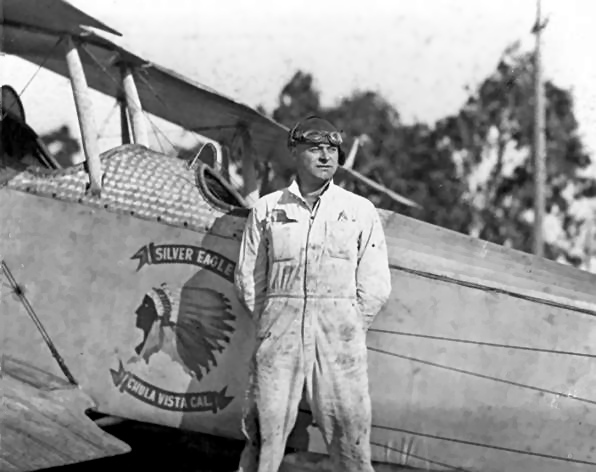 photo of pilot Robert Tyce in front of a Jenny at Chula Vista Airport. Robert & his brother Roland were both pilots & used the airport at the convenience of the railroad. An undated (circa 1930s?) photo of NC8877, a Travel Air 2000 serial #913 biplane at Tyce's Airport. 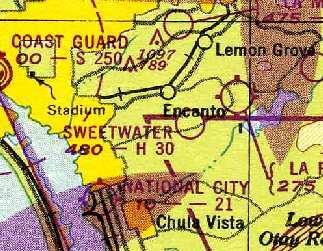 The last aeronautical chart depiction which has been located of Chula Vista Airport was on the 1935 San Diego – Tucson Airway Chart. The end of this little airport was evidently spelled by the need for increased factory space for wartime production. and approved a bond issue of $15,000 to purchase the bayfront site for Rohr Aircraft. Construction began on the first factory, which was 37,500 square feet of space. The company's board of directors worried whether the company would ever be able to fill that huge building. and made plans to build an additional factory & office building. 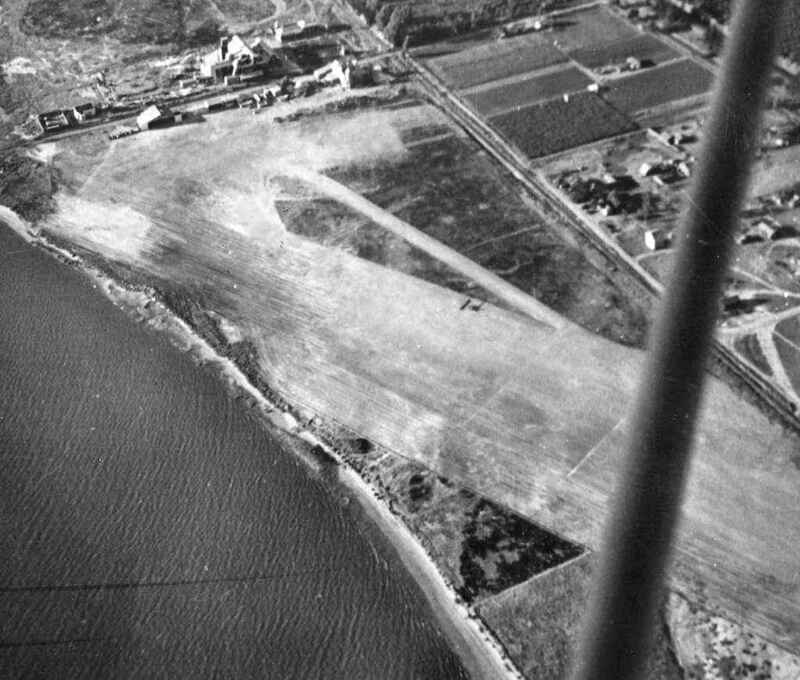 A 1941 aerial view looking northwest at Tyce's Airport. A 1941 photo of “Gibbs Luscombe” at Tyce's Airport, with the Rohr Aircraft building in the background. 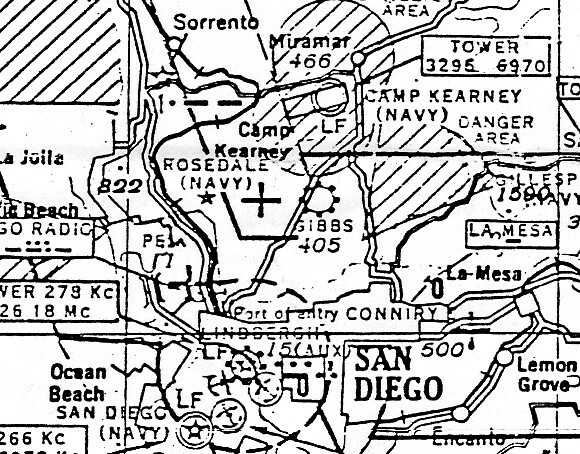 the 1945 San Diego Sectional Chart (courtesy of John Voss), or subsequent maps. An 11/12/12 aerial view showed no trace remaining of Tyce's Airport. The site of Tyce's Airport is located west of the intersection of Lagoon Drive & Interstate 5. Thanks to Richard Scheid for pointing out this airfield. 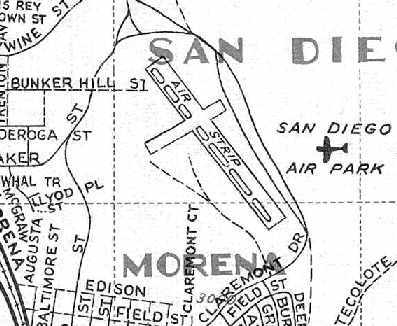 San Diego Airpark, as depicted on the September 1948 San Diego Sectional Chart (courtesy of Chris Kennedy). 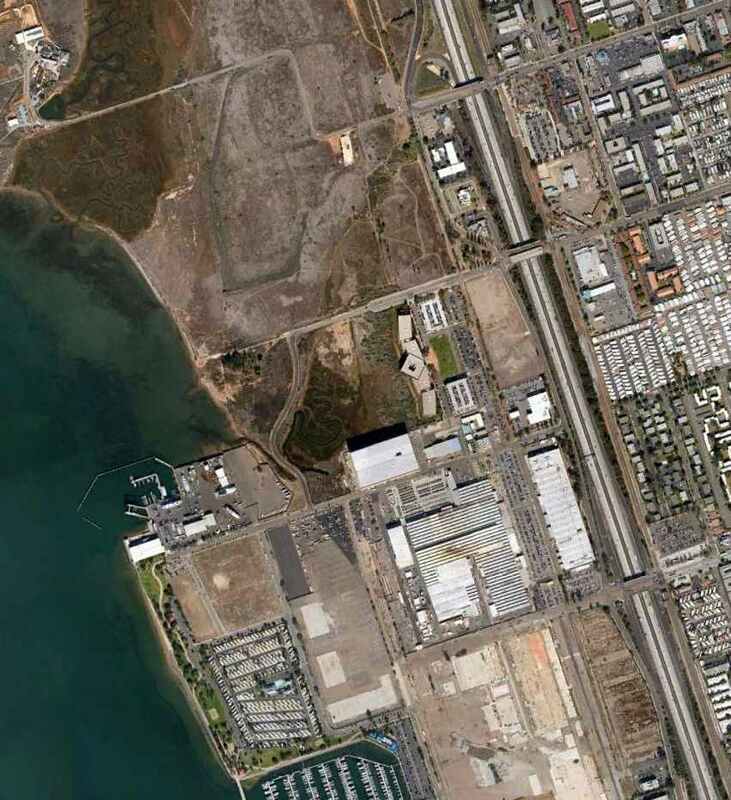 This very short-lived general aviation airport was located just east of San Diego's Mission Bay. which were established across America immediately after the end of the Second World War. nor was it yet depicted on the 1943 USGS topo map nor on the February 1946 San Diego Sectional Chart (according to Chris Kennedy). was on the September 1948 San Diego Sectional Chart (courtesy of Chris Kennedy). It depicted "San Diego Airpark" as having a 2,700' unpaved runway. A 1948 street map (courtesy of Chris Kennedy) depicted "San Diego Airpark" as having 2 runways. 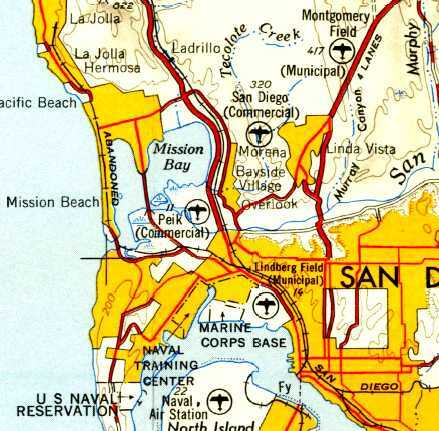 The 1950 USGS topo map depicted “San Diego” as a commercial airport. 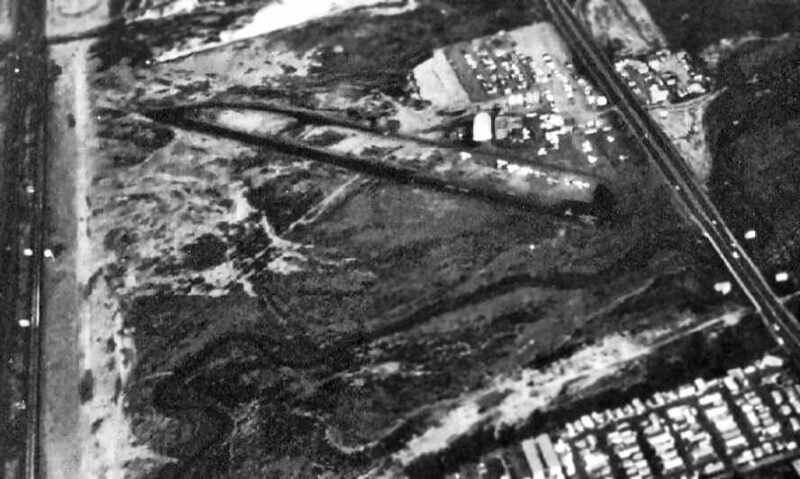 The only photo which has been located showing San Diego Airpark was an undated aerial view looking north from the 1950 Air Photo Guide (courtesy of Kevin Walsh). It depicted San Diego Airpark as having a 2,900' northwest/southeast dirt runway. The field was said to feature an office & hangars, and the manager was listed as E.H. Sullivan. depicted San Diego Airpark as having a 2,900' unpaved runway. Curtis Carroll reported, “The airport was closed in 1951 & the land sold to Clair Burgener & Carlos Tavares; the length of airport structures; offices and café, remained. These became the temporary headquarters of the Claremont Company & newly-chartered St. Mark’s Church. 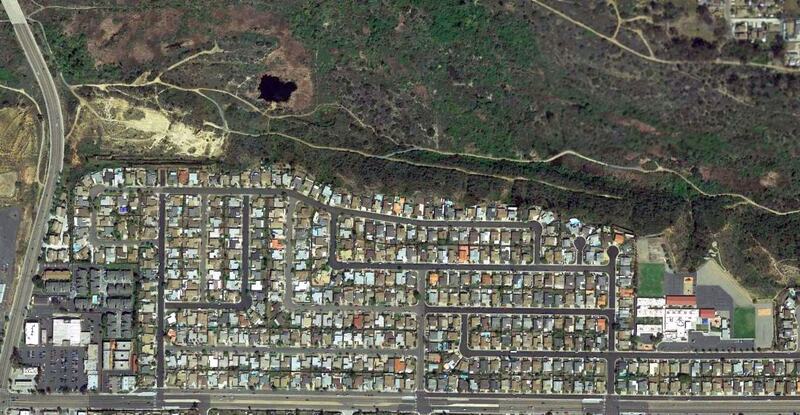 The main runway of the Air Park was quickly paved & extended Clairemont Drive from the south. 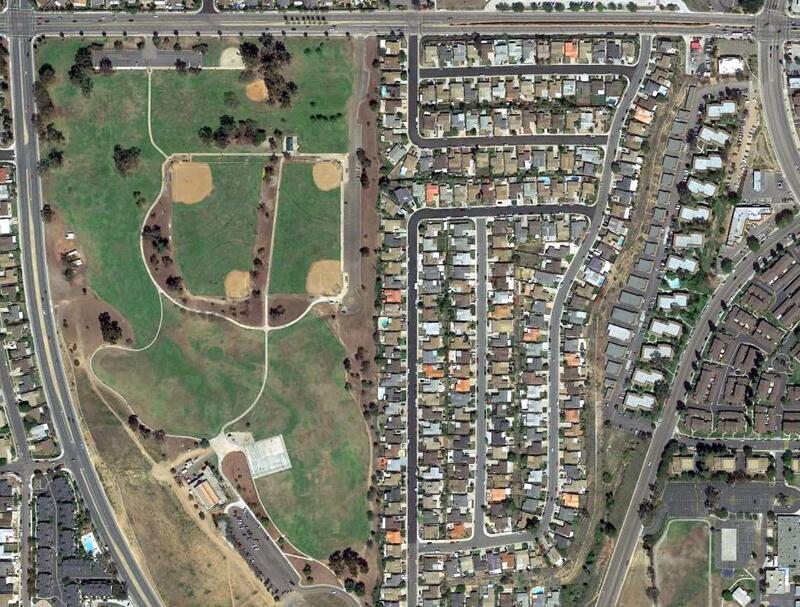 showed that the San Diego Airpark site had been graded & partially developed for housing. An early 1953 aerial view looking southwest at the site of San Diego Airpark (courtesy of St. Mark’s Church Archives, via Curtis Carroll). A 1953 Gousha San Diego Street Map (courtesy of Curtis Carroll) showed the site of San Diego Airpark covered with new residential streets. Curtis observed, “The 2,700' unpaved main runway was now Clairemont Drive between Iroquois & Rappahannock Avenues. 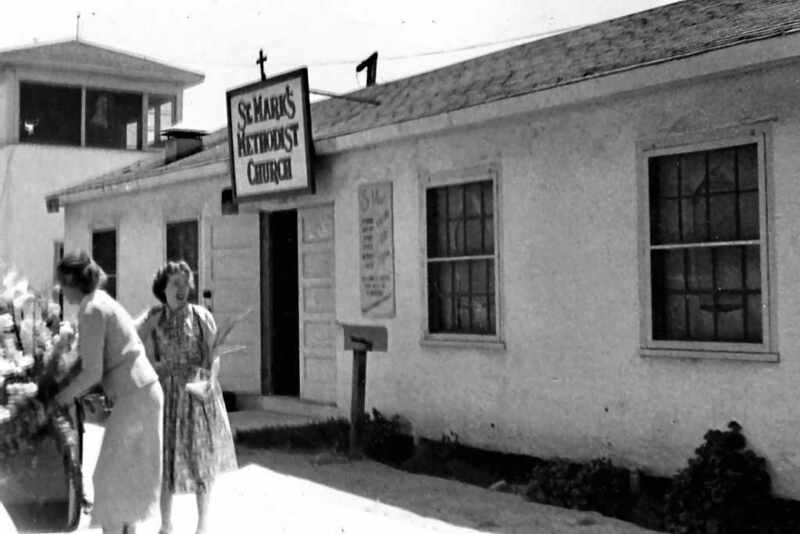 A December 1953 photo of the former San Diego Airpark cafe & tower (courtesy of St. Mark’s Church Archives, via Curtis Carroll), reused as the St. Mark’s Church. San Diego Airpark was no longer depicted at all. even though the airport had already been built over for 2 years. It depicted the field as having 2 runways, with the northwest/southeast runway having a parallel taxiway on the west side. with not a trace appearing to remain of the little airport. and not a trace appears to remain of the little airport. 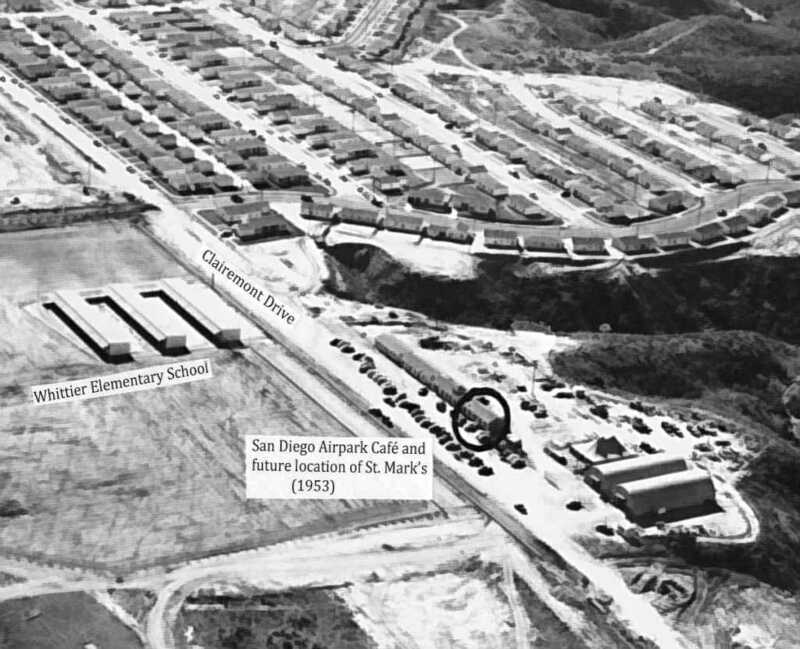 The site of San Diego Airpark is located west of the present-day intersection of Clairemont Drive & Dakota Drive. A 1937 photo of the “Flying Bathtub” homebuilt aircraft taking off or landing at Peiks Airport. This little general aviation airport was located on the southwestern shore of San Diego's Mission Bay. During its relatively short lifespan, the airport was listed under a somewhat confusing succession of somewhat different names. “It all began when a young barnstorming pilot in a battered Stinson monoplane flew into San Diego a couple of weeks before Christmas of 1934. His name was Arnold Peik. Trailing him on the ground was a mud-spattered 1928 Chevrolet sedan, driven by his wife, Lydia, and carrying their son, Leander, 7. Behind the car rolled a homemade 13' house trailer, fashioned in part from old fuselage framing & airplane fabric. where he could set up operations & offer flights to a public still fascinated by the sight of an airplane. He found what he was looking for on the mud flats along the shore of Mission Bay. The area, in the Southeast corner of the Bay near the mouth of the San Diego River, was undeveloped & littered with trash. Peik cleared an 800' strip & on Christmas morning he & his family pulled the trailer to the flats & became squatters in the abandoned 2-room shack. The earliest depiction which has been located of Peik's Airport was a 1937 photo of the “Flying Bathtub” homebuilt aircraft taking off or landing. depicted Peik as having a single northwest/southeast unpaved runway, with a few small buildings on the southwest side. which depicted Peik as a commercial/municipal airport. nor on the 1943 USGS topo map. and showed that "San Diego Radio" was located on the airport as well. According to the San Diego Historical Society, Peik Airport was operated starting in 1943 by Arnold Peik. and taught pilots how to fly on the GI Bill. [and tore down the] maintenance hangar & built another hangar in it's place. The new hangar was used to store the Aeronca Champs overnight. He could get 4 in the hangar by tipping the Champs on their nose. The flight school had about 4 Aeronca Champs, an Aeronca Sedan, a Cessna 140, a Taylorcraft and a couple of PT-22s. There was a hangar & airport cafe on the north side for the field also. My dad rented the north side hangar space out to aircraft owners. described "Peik's Airport" as a "class 1" facility, "owned & operated by A. H. Peik". It was said to have a single 2,400 oiled runway (oriented northwest/southeast) & an 80' x 46' hangar. The field was described as offering storage, repairs, charter, and fuel. and the the radio towers on the right. A 1946 aerial view looking northwest along final approach at Piek's Airport (courtesy of John Nance). John observed, “The airport café is on the east side of the north side hangar [on the right]. Crown Point & Pacific Beach & Mt. Soladad are visible in the background. by 1946 Peik Airport featured a 2,600' oiled runway & 3 hangars. An undated (1940s?) photo of several Pipers & Aeroncas in front of the Peik hangar. labeled the field with a different spelling: "Piek" Airport. It was depicted as having a 2,400' unpaved runway. 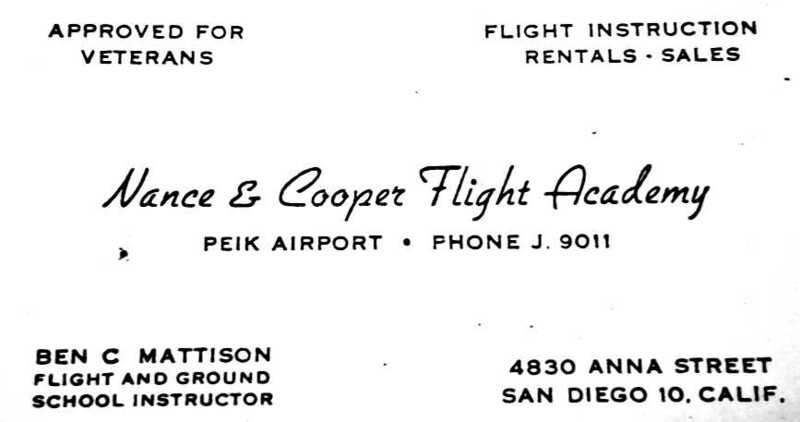 An undated business card for Peik Airport's Nance & Cooper Flight Academy (courtesy of Mike Oliver). 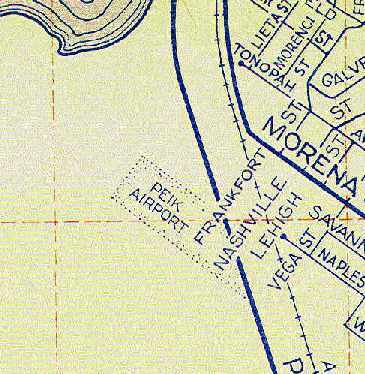 The 1950 USGS topo map depicted “Peik” as a commercial airport. as having a 2,800' oil surface Runway 12/30, and the manager was listed as B.P. Nance. followed by a private certificate, commercial, multi-engine and single-engine seaplane I believe in 1955. It was a great 'little' airport to train at. You could get in 7 or 8 takeoffs & landings an hour when traffic was light. and ended into rising terrain on the southeast end where the highway & a hill intersected." continued to depict the field under the spelling of "Piek". 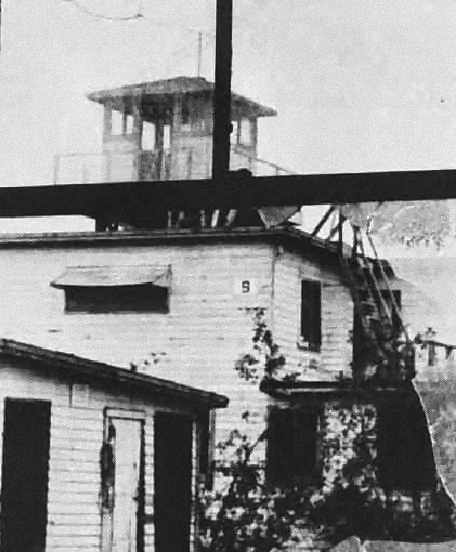 Mark Dossett reported, “The daughter of Arnold Peik (Peik's Airport) grew up in a house that was located at the field. A 1952 aerial view looking northwest along short final at Piek's Airport (courtesy of John Nance). John observed, “You can see the front part of the hangar that my dad put up. A 1952 photo taken just about at touchdown of Piek's Airport (courtesy of John Nance). John observed, “You get a good view of the flight operations office. with 20 light aircraft parked on the west & south sides. 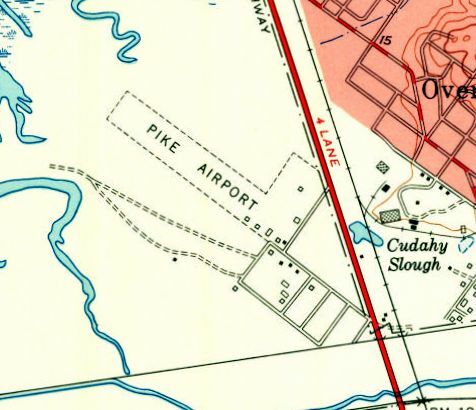 The 1953 USGS topo map misspelled the name of the airport as “Pike Airport”. It depicted the field as having an unpaved northwest/southeast runway, with a few small buildings on the east side. 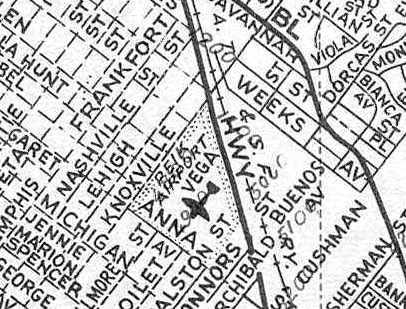 A 1953 street map (courtesy of Kevin Walsh) depicted "Peik Airport" as a rectangular property outline. Peik Airport was still depicted on the 1954 USGS topo map. bounded by Knoxville, Anna, Connors, and Pacific Highway. being quite a bit smaller than would have been possible given the runway length listed for this field on multiple aeronautical charts. This situation was explained by Johannes Long: “The streets on that map that are all dashed lines are all paper streets that did not exist then & [most] do not exist now. Only Anna & a couple of others streets were actually built & used as access to the airport. There are a number of old maps of San Diego with grid street patterns laid out across everything from deep canyons & steep slopes as well as mud flats such as Mission Bay. 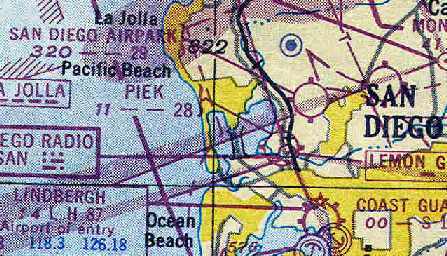 The September 1955 San Diego Sectional Chart (courtesy of Chris Kennedy) depicted the field under another spelling: "Pikes" Airport. The Aerodromes table described the field as having a single 2,600' bare runway. The San Diego Radio facility was still depicted immediately adjacent to the southeast side of the airport. but like the 1955 map it also seems to show the airport's boundaries as too small to have contained a runway of 2,000-2,600' in length. 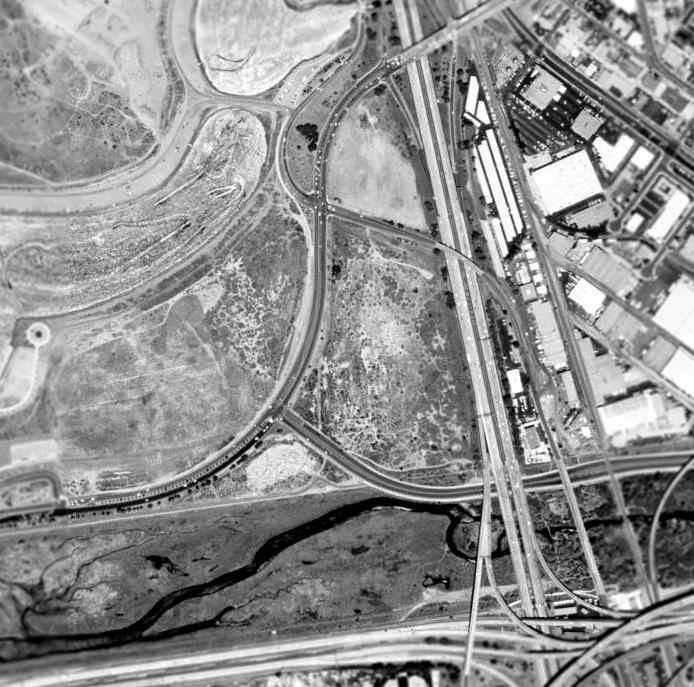 and then closed the airport in 1957 in connection with the development of Mission Bay Park. 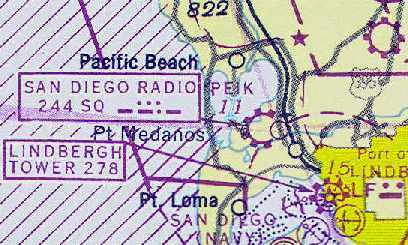 Peik Airport was no longer depicted at all on the September 1958 San Diego Sectional Chart (according to Chris Kennedy) nor on the 1958 USGS topo map. in preparation for the construction of parkland & roads which would eventually cover the site. and not a trace appears to remain of the former little airport. The site of Peik Airport is located roughly southwest of the present-day intersection of Interstate 5 & Sea World Drive. 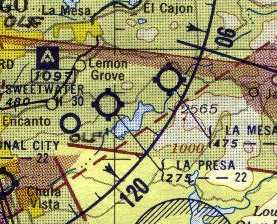 La Pressa Airport, as depicted on the 1945 San Diego Sectional Chart (courtesy of Chris Kennedy). The date of construction of this little general aviation airport has not been determined. 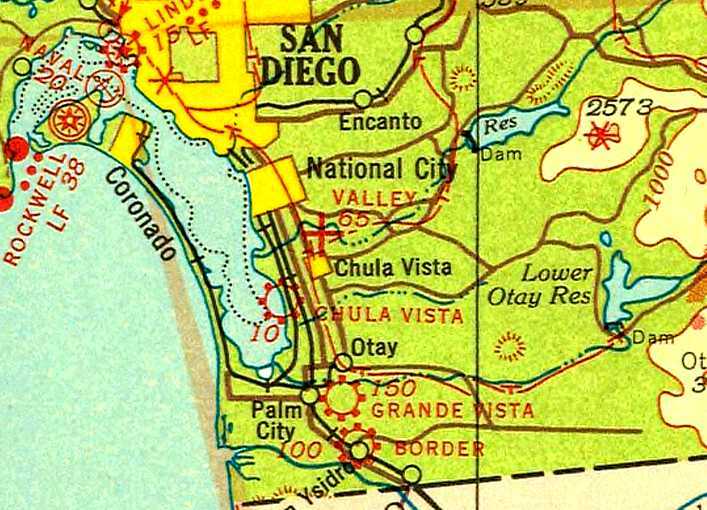 as it was not yet depicted on the 1944 San Diego Sectional Chart (according to Chris Kennedy) nor the 1944 USGS topo map. was on the 1945 San Diego Sectional Chart (courtesy of Chris Kennedy). It depicted La Pressa Airport as having a 2,400' unpaved runway. A 1945 photo of an Aircoupe at the La Pressa Airport. Tow 1947 photos of Bob Lyth in front of several airplanes at La Pressa Airport. along with a few small buildings on the northwest corner of the field. showing over a dozen light aircraft parked at the field. 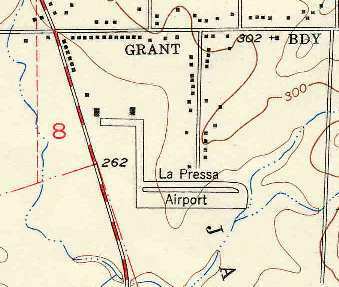 The 1950 USGS topo map depicted “La Pressa” as a commercial airport. leading to a short east/west taxiway at the northwest corner of the property, along which were 2 buildings (hangars?). 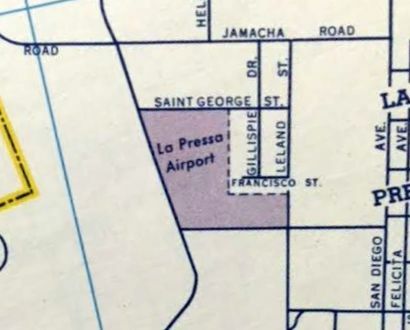 A 1953 street map (courtesy of Kevin Walsh) depicted La Pressa Airport as an L-shaped property outline. with 15 light aircraft on the west side. described “La Presa” Airport as having 2 runways, with the longest being a 2,200' bare strip. An undated (1950s?) street map depicted “La Presa Airport”. The last depiction which has been located of La Pressa Airport was on the 1958 USGS topo map. An undated (1950s?) 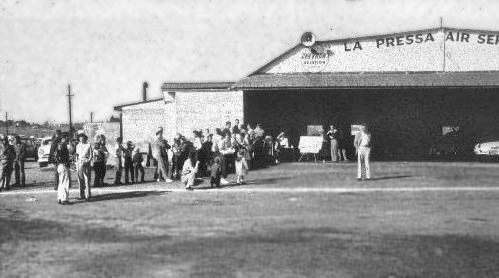 photo of a gathering outside a La Pressa Air Service hangar. Possibly taken after the airport's closure, as there appeared to be cars inside the hangar instead of planes. as it was not depicted at all on the September 1958 San Diego Local Aeronautical Chart (according to Chris Kennedy). Richard Hardin recalled, “In 1963 the La Presa Airport was a 220 mobile home park called 'Sweet Water Lodge'. I remember 2 hangars on the old strip that were used for beer storage. 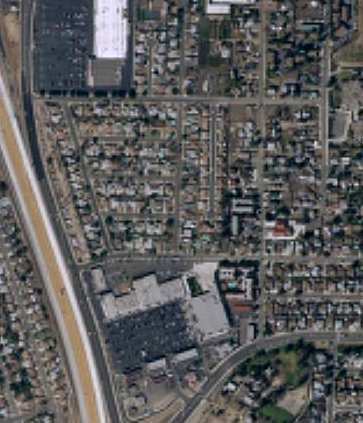 and the southern portion was covered with the Spring Valley Shopping Center. 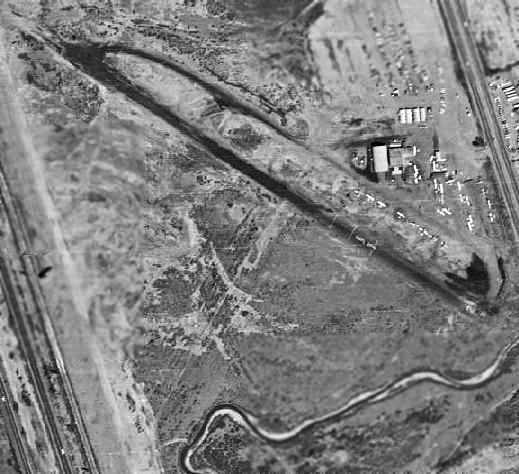 The 1994 USGS aerial photo did not appear to depict any remaining trace of the former airport. A circa 2001 aerial photo of the site of the airport. 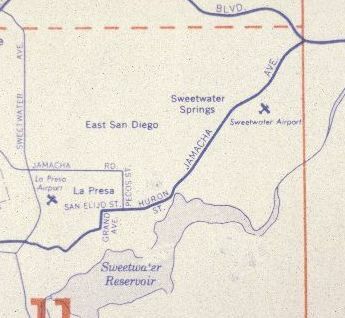 The site of La Pressa Airport is located northeast of the intersection of Sweetwater Road & Jamacha Boulevard. An 11/17/39 U.S. Navy aerial view looking west at “Madson Airport” (courtesy of Brian Rehwinkel). as it was not yet listed among active airfields in The Airport Directory Company's 1937 Airport Directory (courtesy of Bob Rambo). was in the 1/1/38 US Department of Commerce Airports & Landing Fields Bulletin (courtesy of Scott Murdock). It described Madson as a commercial airport, located one mile south of National City, on the west side of Highway 101.
oriented 2,000' east/west & 1,700' northeast/southwest. A hangar roof was said to be marked with “Madson Flying Service”. Madson Airport was listed in The Airport Directory Company's 1938 Airport Directory (according to Chris Kennedy). was an 11/17/39 U.S. Navy aerial view (courtesy of Brian Rehwinkel). a primary east/west runway, and a much less distinct northeast/southwest strip. and 2 small single-engine aircraft were visible near the hangars. 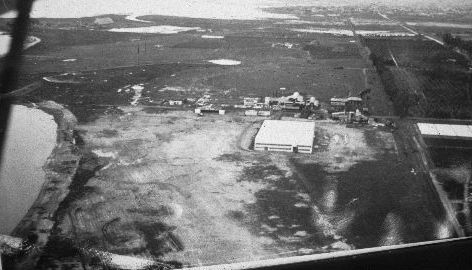 A 1941 aerial view looking west showed Madson Airport to have 2 hangars & 9 light aircraft on the east side of an unpaved landing field. Madson Airport was still listed in The Airport Directory Company's 1941 Airport Directory (according to Chris Kennedy). which depicted Madson as a commercial/municipal airport. 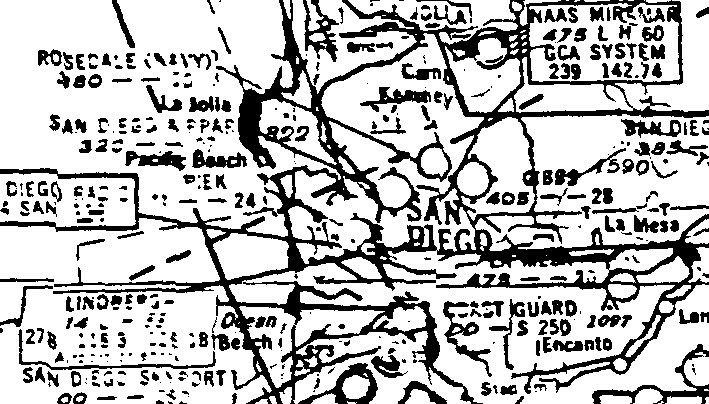 Madson Airport was still depicted on the August 1943 San Diego Sectional Chart (according to Chris Kennedy). as the 1944 USGS topo map depicted the site of the airport as a blank, unlabeled area, but it did depict the 2 hangars. 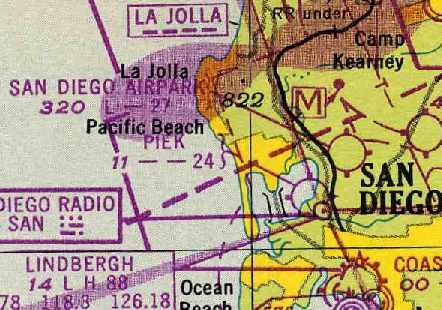 Madson Airport was not depicted on the 1945 San Diego Sectional Aeronautical Chart (courtesy of John Voss). as that is how it was depicted on the February 1946 San Diego Sectional Chart (courtesy of Chris Kennedy). described National City Airport as having a 2,100' unpaved runway. 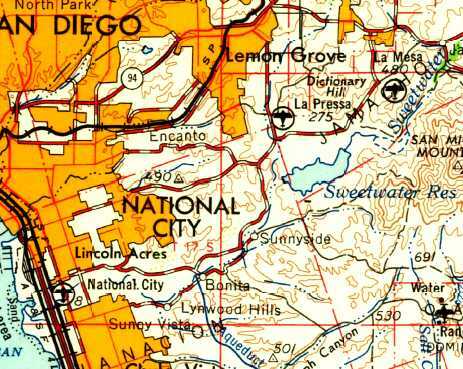 The 1950 USGS topo map depicted “National City” as a commercial airfield. An undated aerial view looking north at National City Airport from the 1950 Air Photo Guide (courtesy of Kevin Walsh). The guide depicted National City Airport as having a 2,200' blacktop Runway 9/27, and listed the manager as M.C. Morgan. depicted National City as having a 2,200' unpaved runway. The earliest photo that has been located of National City Airport was a 1953 aerial view. with what appeared to be an outline of a former crosswind runway. A dozen light aircraft were parked around a hangar on the northeast side. as consisting of a single 1,800' northwest/southeast runway. Several small buildings (hangars) were depicted along the east side of the runway. 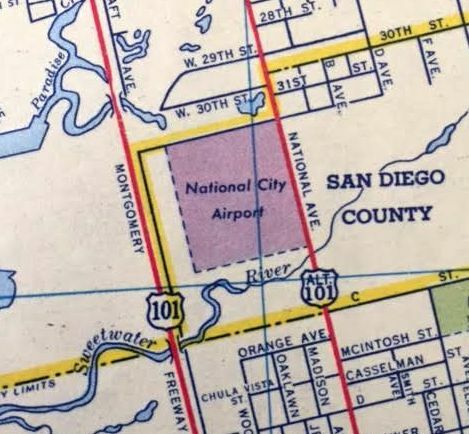 A 1953 street map (courtesy of Kevin Walsh) depicted National City Airport as a square property outline. described National City Airport as having 2 runways, with the longest being a 2,200' bare strip. 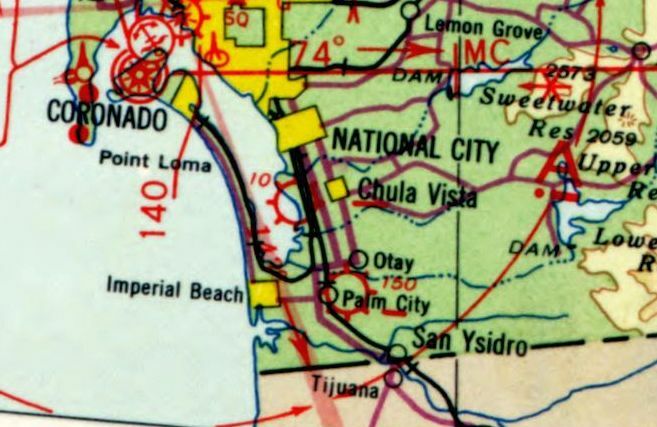 in what I thought was National City on the west side of what was probably US 101.
and La Pressa (June 1958); dates taken from my Pilots Logbook. which probably helped in the decision to close the field. I was working for the power company at the time & was asked my opinion about the hazard of the lines. Of course I said they were no hazard, at least not for me. I frequently flew out (& in) at night; taking off to the west, landing to the east. and left on as long as there was a pilot's note attached. The lights were staggered - half on one side of the runway to the east end, and the other half on the other side to the west end. When lining up for a landing at night, I lined up the lights so they appeared as 2 vertical offset lines. If I was off to the right or left of centerline, the lights would not be vertical lines. Glide was set up to clear the power lines when landing to the east. with a parallel taxiway on the north side leading to a ramp with several buildings on the northeast corner of the field. and thinking this must be what carrier pilots do as it was a steep approach. There were wires along the main boulevard to the east as well as homes on a small bluff to the southeast. So as soon as you cleared those you dropped down to the crumbling asphalt runway. I liked going there because they used to fly T-6s out of there (civilian). not far to the west that were marked with red balls." described National City as having a 2,000' hard-surface runway. 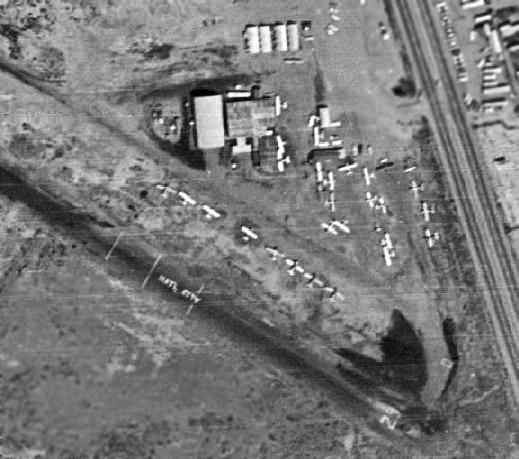 A closeup from the 1964 aerial view depicted several hangars & 28 single-engine aircraft on the east side of the field. Note the “Natl City” painted on the runway – apparently the extra 4 letters to completely spell “National” would've been too expensive! showing several planes (including a T-6 Texan) around the Bar Aero hangar. E.J. Recalled, “The third car up on the left is my '57 Ford Fairlane. I started flying there in 1954.
was on the August 1965 San Diego Sectional Chart (courtesy of Ron Kunse). A December 1965 aerial view looking north at National City Airport by Ray Ganzer. Several light planes were visible parked on the east side of the field. A December 1965 photo by Ray Ganzer of an Ercoupe at National City Airport, with the hangars of Bar Aero in the background. 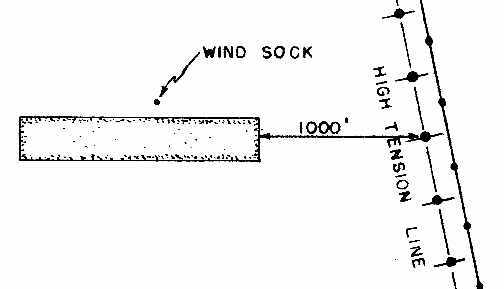 depicted it as having a mere 1,000' runway. with the remarks saying, "West half of runway gravel closed when wet." 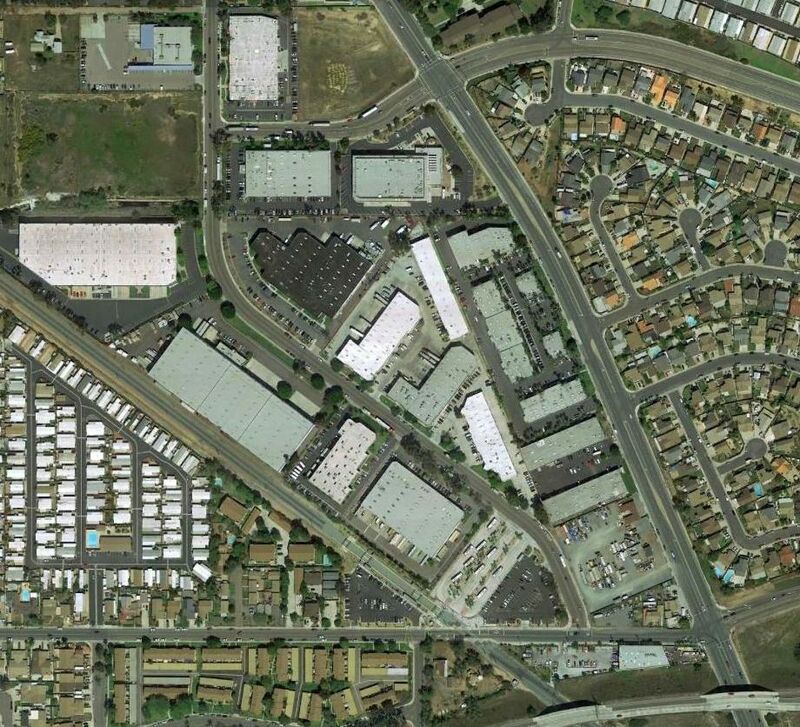 “The property was sold in January 1966 to San Diego Imperial Corporation to create an industrial park. The airport closed about a month later. It was the last privately-owned airfield in San Diego County. or on the 1978 USGS topo map. A 1980 aerial view depicted several buildings covering the southern portion of the airport site. Not a trace appeared to remain of National City Airport. A 1989 aerial view showed a canal had been built across the northern part of the airport site. 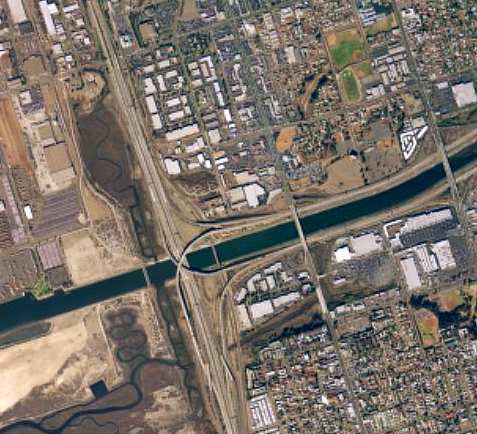 the site of National City Airport had been obliterated with a new freeway (Route 54) & a drainage canal. Not a trace appeared to remain of the former airport. 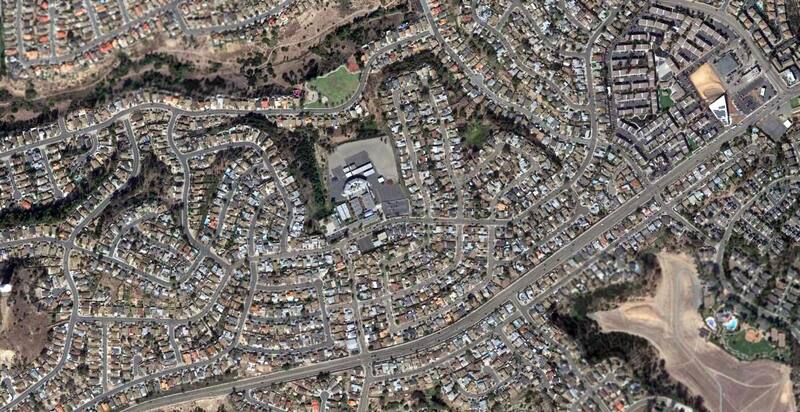 The site of National City is located west of the intersection of National City Boulevard & West 35th Street. Naval Operating Base San Diego” (courtesy of Brian Rehwinkel). The date of construction of the Rosedale airfield has not been determined. Naval Operating Base San Diego” (according to Brian Rehwinkel). 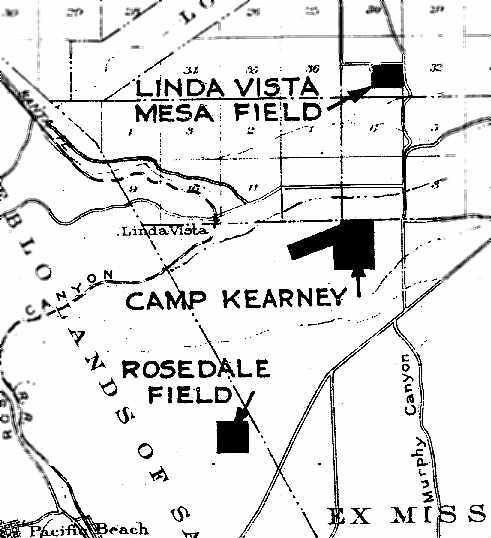 It depicted “Rosedale Field” simply as a square outline. attached to San Diego NAS (North Island). 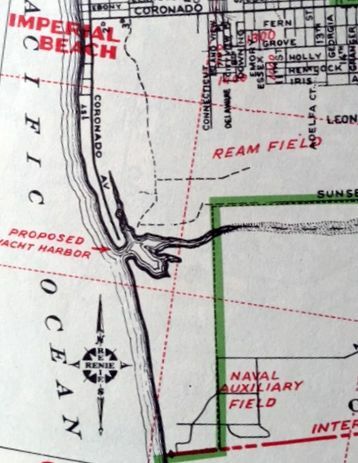 Rosedale Field was not yet depicted on the August 1943 San Diego Sectional Aeronautical Chart (courtesy of Ron Plante). 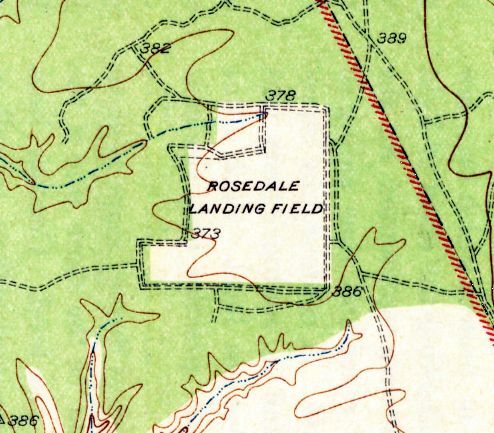 depicted the "Rosedale Landing Field" simply with an irregularly-shaped boundary of the property. depicted the field as being roughly square shaped, with several cut-outs on the north side, including an olive grove which remained for years. There did not appear to be any buildings or other improvements associated with the airfield. 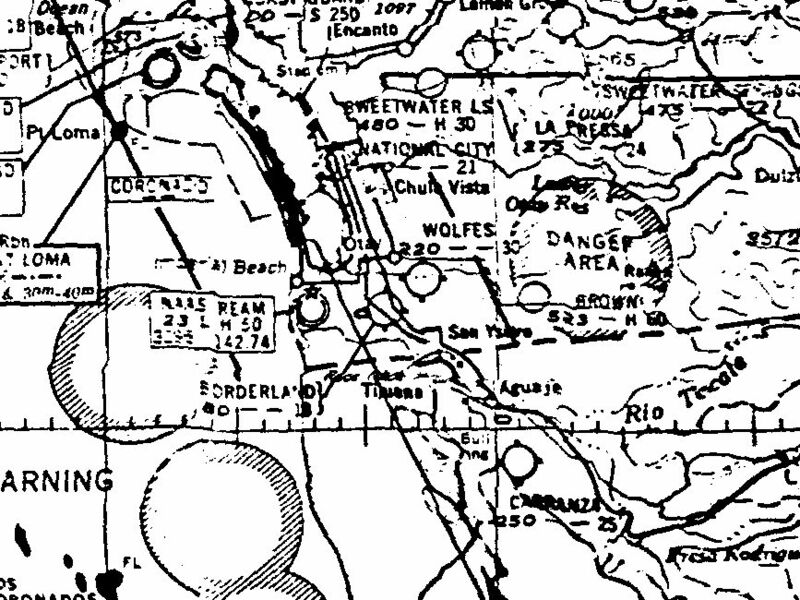 was on the March 1944 San Diego Sectional Chart (courtesy of Ron Plante). It depicted Rosedale as an auxiliary field. was considerably different from how the field was previously depicted. It described the field as having a single 1,500' adobe Runway 9/27. with the northern portion no longer used as a landing area. Rosedale Field was described as being assigned to NAS San Diego for administrative & maintenance purposes. was an admittedly poor quality image of the March 1948 San Diego Sectional Chart (courtesy of Ron Plante). described “Rosedale (Navy)” as having only a 1,000' unpaved runway – a very short strip. It is not known if Rosedale was ever reused for civilian flying. 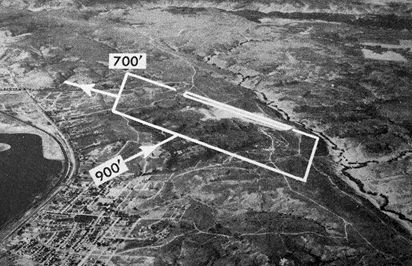 nor even depicted as an abandoned airfield on the March 1951 San Diego USAF Sectional Aeronautical Chart (courtesy of Chris Kennedy). 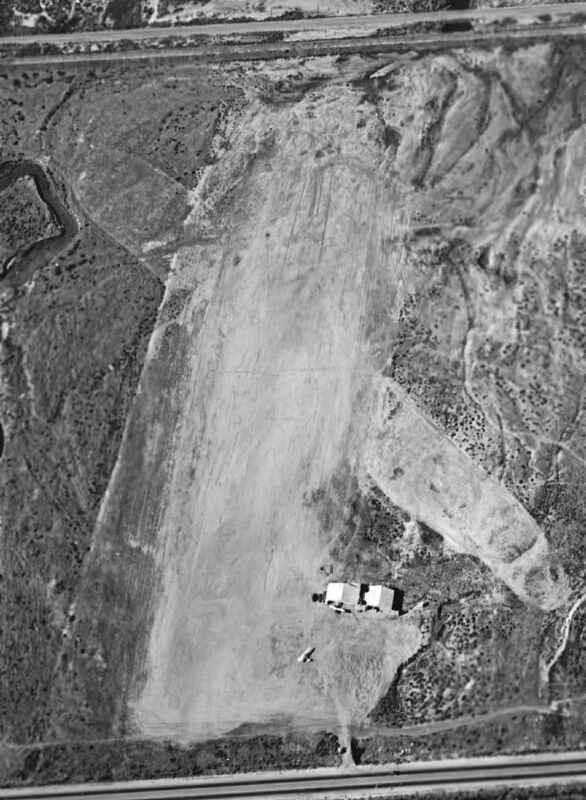 A 1953 aerial photo showed the Rosedale airfield remained clear. with the area having been densely redeveloped at some point between 1953-64.
with not a trace appearing to remain of the former airfield. Thanks to John P. for determining the specific location. 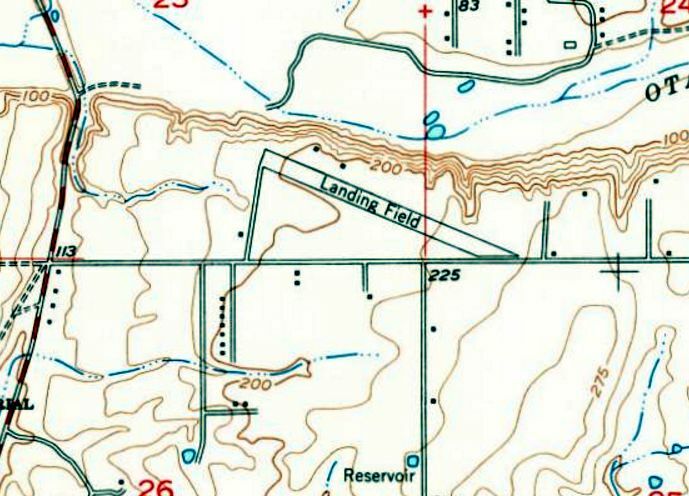 The site of Rosedale Landing Field is located northeast of the intersection of Mt. Abernathy Avenue & Balboa Avenue. 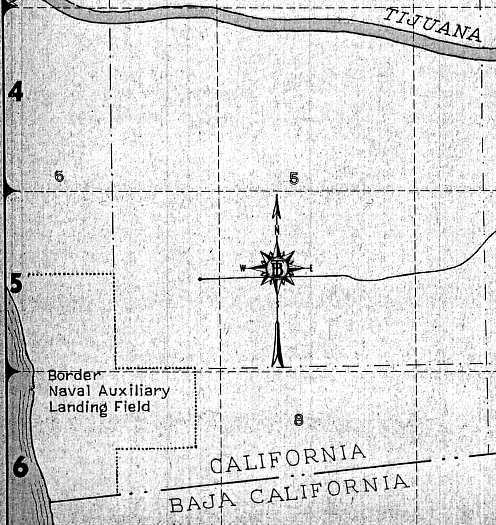 Border Field, as depicted on the 1943 USGS topo map (courtesy of Scott O'Donnell). 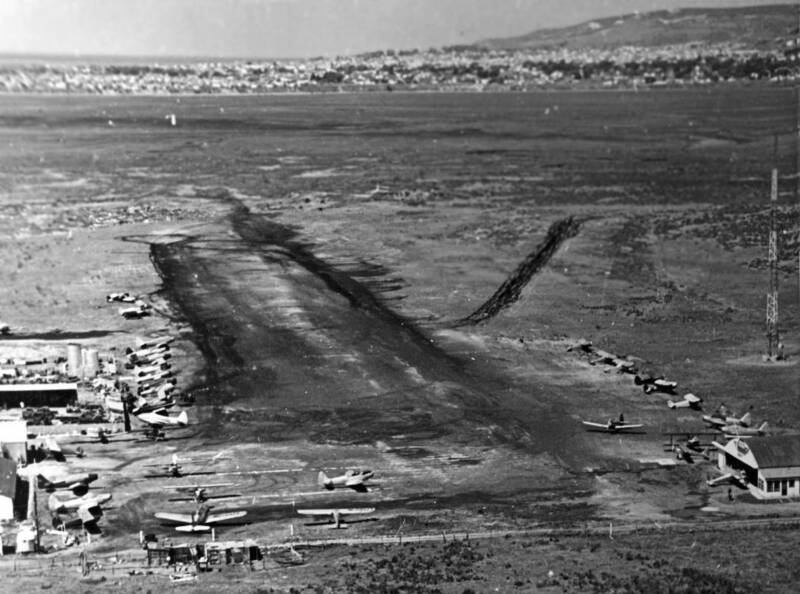 as one of at least 12 auxiliary airfields attached to San Diego NAS (North Island). and directly north of the Mexican border. 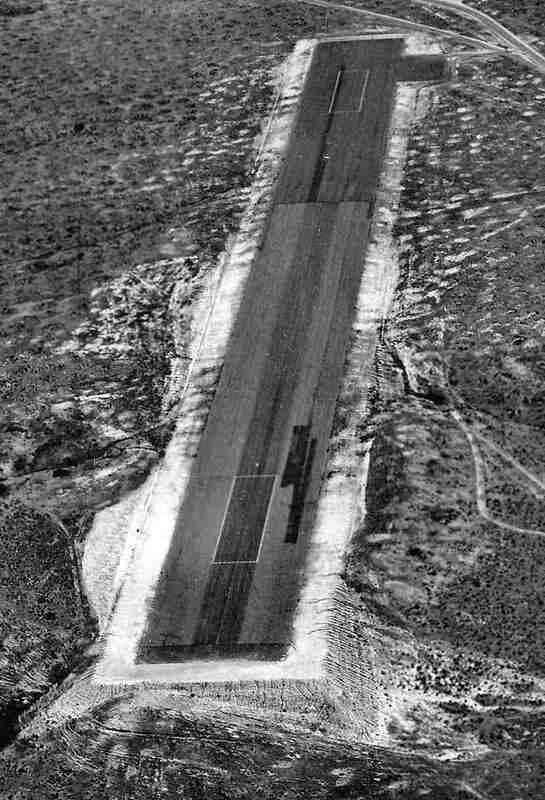 The original runway configuration at Border Field is unknown (it may have been an unpaved field). included "Recommended Development: One 'standard' runway into the prevailing wind." It also said, "Proposed Use: Dive bombing; gunnery training; and practice landings during dry weather." Naval pilots received gunnery training at Border Field. 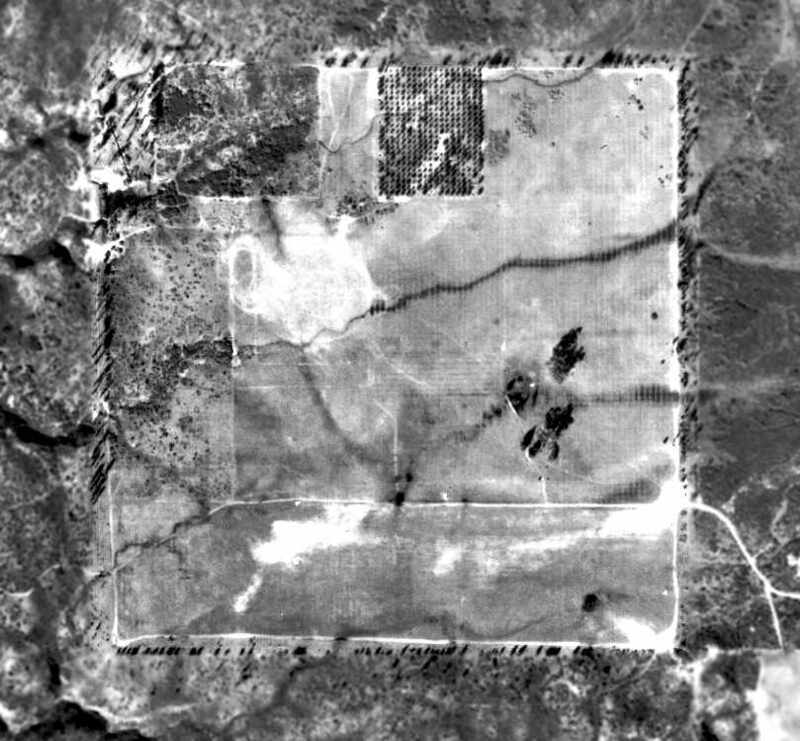 An April 14, 1945 USDA aerial photo of Border Field (courtesy of Brian Rehwinkel). The airfield was evidently the rectangular area in the center of the photo. Note the target ranges to the west, along the ocean. 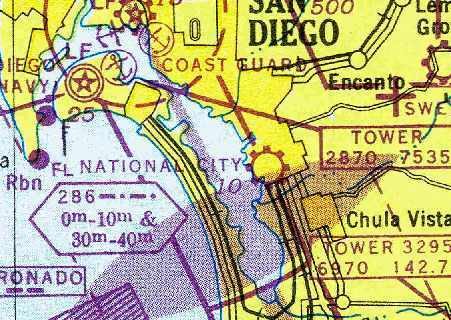 San Diego Sectional Aeronautical Charts from 1945, 1948, 1949, and 1955. 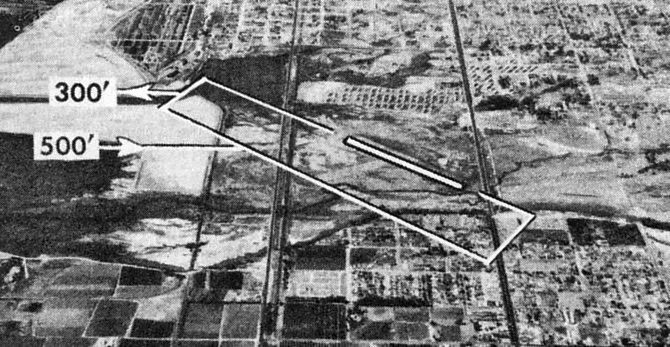 Border Field was redesignated a “target drone training area & emergency landing strip” in early 1950. Bob Raczkowski recalled, “My dad was a U.S. Navy pilot at Brown Field in VU-3, a drone squadron. Border NALF, as depicted on a 1956 street map (courtesy of Chris Kennedy). in 1961 Border Field was turned over to the GSA, then the Naval Electronics Lab for research. 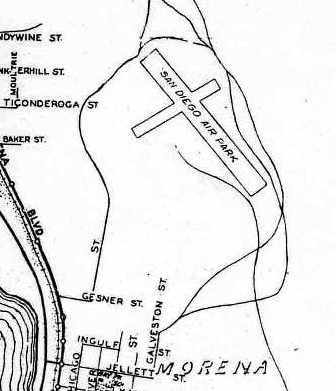 Border Field was still labeled "Naval Auxiliary Field" on the 1961 street map (courtesy of Kevin Walsh). A 1964 aerial view still depicted a row of small buildings along the west edge of Border Field. from the August 1969 issue of “Naval Aviation News” (courtesy of John Voss). The site was still labeled "Border Field Naval Reservation" on the 1975 USGS topo map. 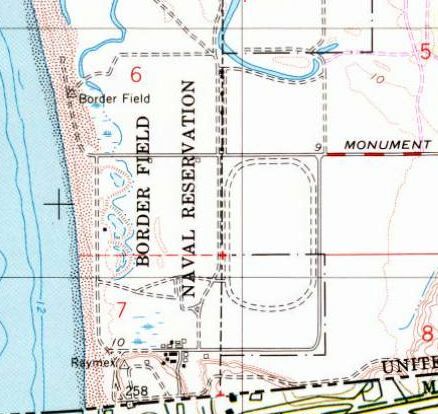 of the "Border Field Naval Reservation" on the 1976 USGS topo map. along with a 3,000' east/west strip extending inland from the north end & a 2,000' strip extending inland from the south end. A very rough conjecture, though. 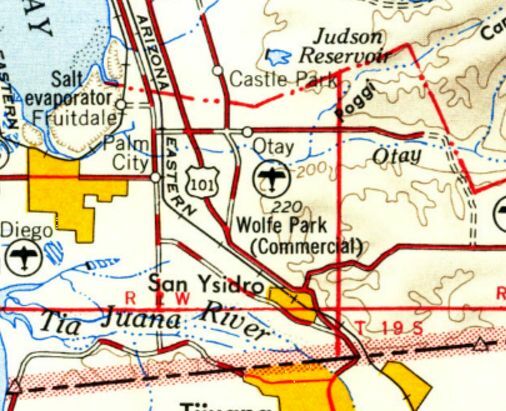 The site of the former airfield was labeled "Border Field State Park" on the 1979 USGS topo map. The park has been called "California's Ugliest State Park"! A 1980 aerial view showed that the buildings along the western edge of the field had evidently been removed at some point between 1964-80.
but traces of any runways were no longer apparent in a circa 2000 aerial photo. 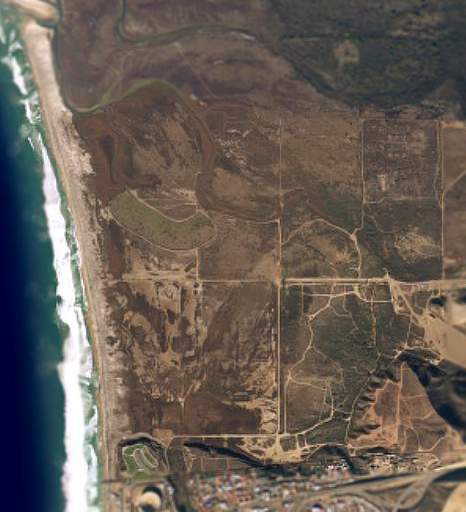 Border Field is located at the western terminus of Monument Road, just north of Tijuana. Thanks to John Voss for information about Border Field. 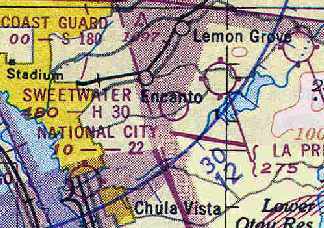 “Sweetwater Dam (Navy)”, as depicted on the February 1946 San Diego Sectional Chart (courtesy of Chris Kennedy). 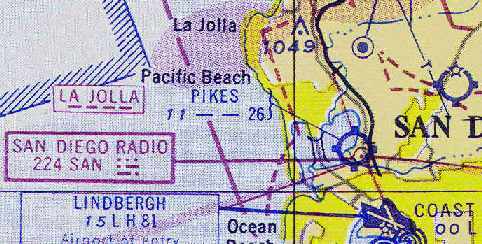 on the 1944 USGS topo map nor on the March 1944 San Diego Sectional Chart (according to Chris Kennedy). was on the 1945 San Diego Sectional Aeronautical Chart (courtesy of John Voss). 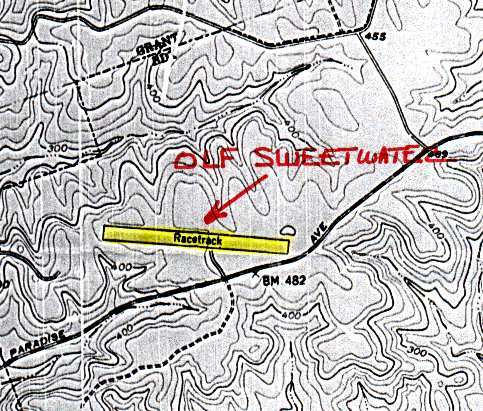 It labeled this field "Sweewater Dam (Navy)". The field was reportedly also known as Paradise Mesa. still depicted the field as "Sweewater Dam (Navy)". 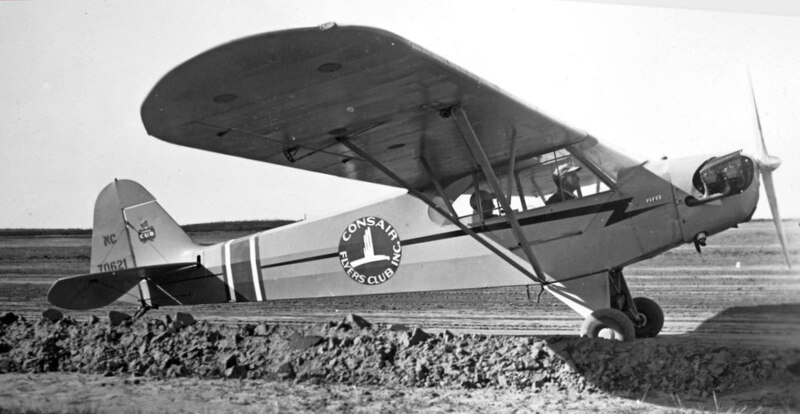 The only photo which has been located showing an aircraft at Sweetwater was a 1946 photo of a Piper J-3C Cub of the Consair Flying Club at the “Sweetwater Air Ranch”. as it was not depicted at all on the 1948 San Diego Sectional Chart (courtesy of Chris Kennedy). A May 1948 U.S. Navy aerial view (courtesy of Brian Rehwinkel) looking east at Sweetwater Dam OLF. Brian observed, “It shows a pilot’s view on final approach. You can see the steep drop off at the end of the field. It gives you an idea of how hilly the terrain was around this field – and how a great deal of foundation work had to be done in order to build this field in these hills. These photos are a part of a series of shots the Navy took in May 1948 of OLFs in Sothern California. with a small parking pad on the southeast side. The field did not appear to have any buildings. Brian observed, “You can see the landing areas (rectangular) painted on the field. as that is how it was depicted on the 1949 San Diego Sectional Chart (courtesy of Chris Kennedy). Note that the same chart also depicted a "Sweetwater Springs" airport a few miles to the east. 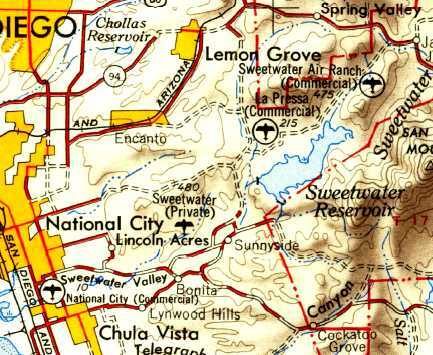 The 1950 USGS topo map depicted “Sweetwater” as a private airfield. 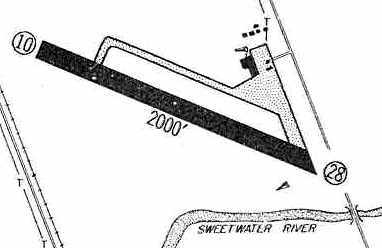 depicted Sweetwater as having a 3,000' hard surface runway. An undated (1950s?) 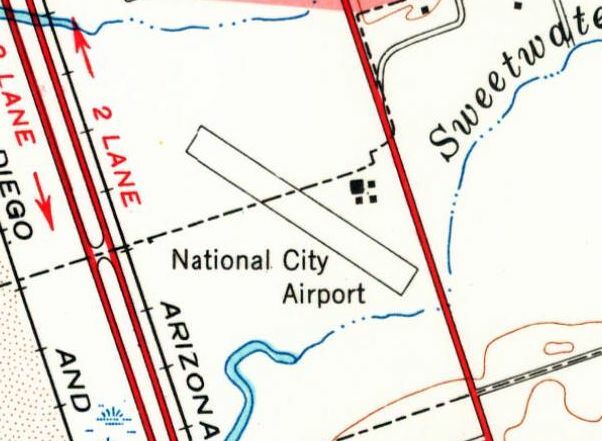 street map depicted Sweetwater Airport. 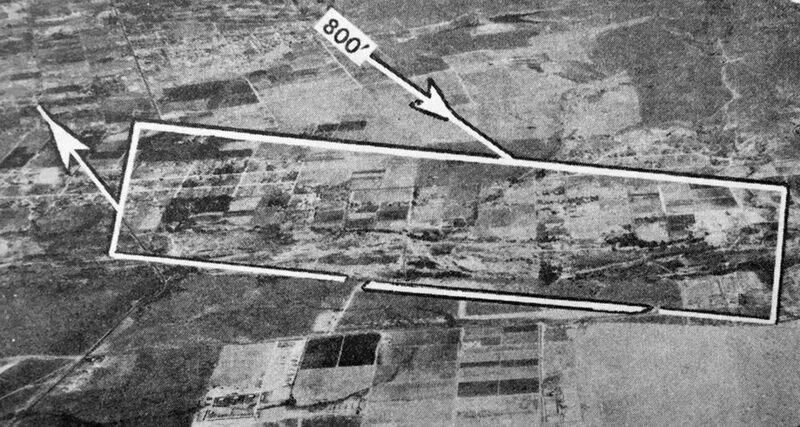 The 1953 USGS topo map (courtesy of John Voss) depicted the runway of the former NOLF Sweetwater, by that time labeled "Racetrack" . 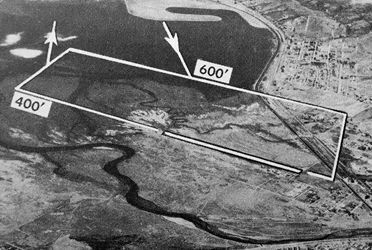 The last aerial photo which has been located of the Sweetwater Dam airfield was a 4/14/53 aerial view (from the UCSB Library). It depicted Sweetwater Dam Airfield as having a single east/west asphalt runway, with a small parking pad on the southeast side. An auto racing outline was perceptible on the runway. 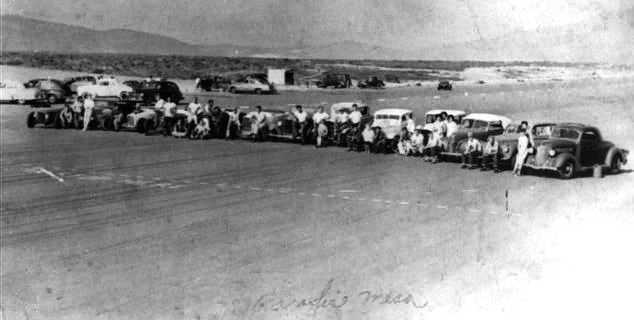 The last photo which has been located of the Sweetwater Dam airfield was a 1954 photo (courtesy of Tony Cantarini) of drag racers on the “Paradise Mesa” dragstrip. Tony Cantarini recalled, “I was born in Paradise Hills in 1961. I did hear a lot about the [airfield] named Sweetwater Dam NOLF, even though none of the stories involved aircraft or the use of that name. The many stories about it came from my Dad, Mom, Uncle and their high school friends that used it from the late 1940s until 1959. They always called it Paradise Mesa Airstrip. There were many stories of how they would line up with 8 cars & race. The fastest 4 would turn around & race back followed by the other 4. Eventually this would continue until 4 were going one way & 4 were coming the other way. If everyone observed 'the imaginary center line' there wouldn't be a problem. Unfortunately, accidents happened & the West end of the strip saw tragedy also, due to a steep drop near the end of the runway. I can see why it was used for carrier landing practice. so they organized and suddenly the beginnings of the NHRA evolved & events were held on weekends from 1951-59. My Dad & many others still used it during the week. The police would try to run the street racers off the strip or catch them, but their under-powered police cars couldn't catch anyone. At the time, there was open land, canyons & trails in all directions from the Mesa and getaways were easy. Tony continued, “I can't think of any practical commercial use it could have been used for... it was so isolated. Maybe if someone would have started a flight school it may have lasted much longer. I have my doubts. are the ones that live in the Spanish mansion at the west end of Paradise Valley Road. Every 5 to 10 years, they would sell off sections of land to developers. from 'the woman that owned the land' (a phrase my Dad used) in order to have sanctioned racing. on the 1955 San Diego Sectional Aeronautical Chart (courtesy of John Voss). and included the remark, "Auto racing on field. Closed weekends." as it was no longer depicted at all on the September 1956 San Diego Sectional Chart (according to Chris Kennedy). the Sweetwater runway was used as a commercial drag strip until 1959.
the former Sweetwater Dam NOLF was labeled as "Abandoned Airport". 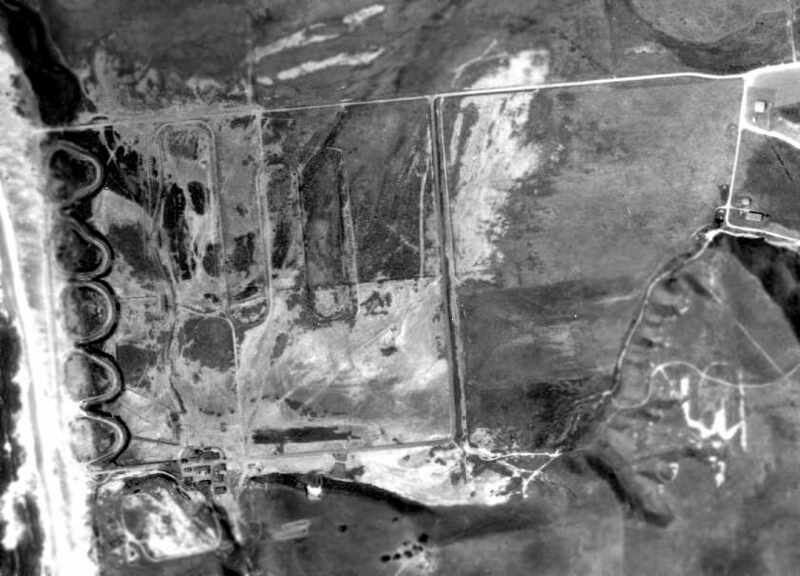 A 1964 aerial view showed that the site of the Sweetwater Dam airfield had been covered with houses. Fulton Recepcion recalled, "I grew up about 1.5 miles west of the former OLF site. 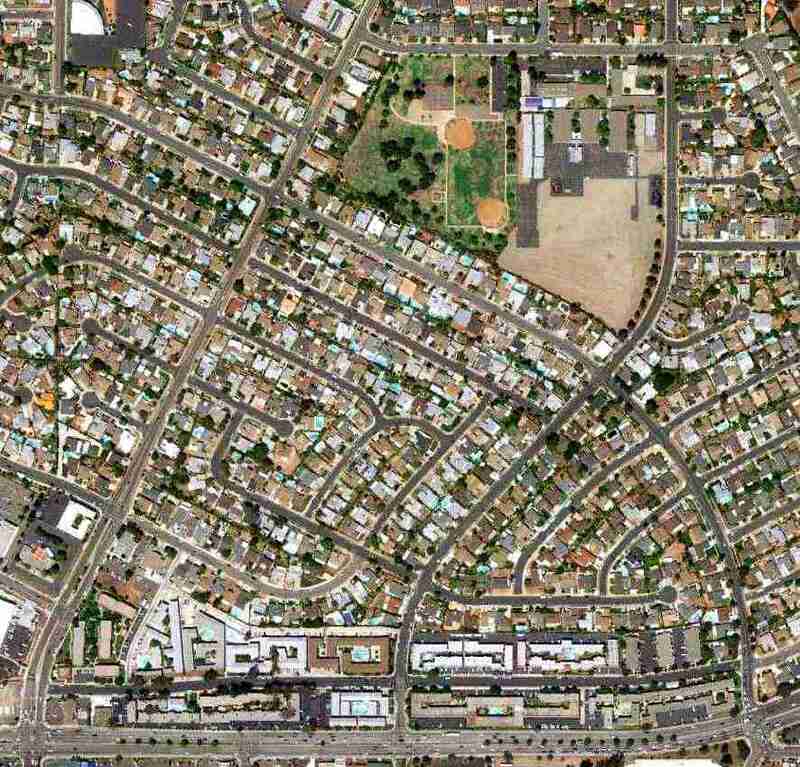 I lived in Paradise Hills [the present-day community at the location of the former airfield] from 1977-91. I think the houses [built over the site of the former airfield] went up in the late 1960s & early 1970s." A 2016 aerial photo shows the Sweetwater Airport property has been completely redeveloped with houses, with not a trace remaining of the former airfield. of Paradise Valley Road & Briarwood Road. Thanks to John Voss for information about Sweetwater.